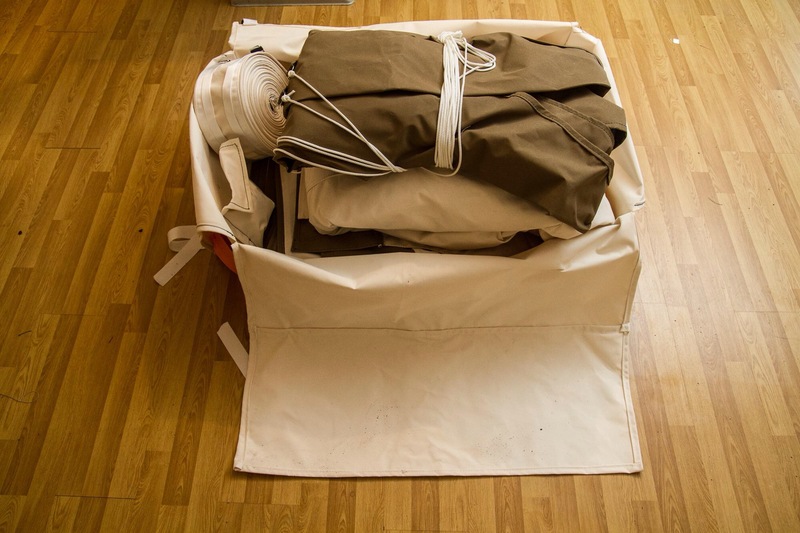 If you have canvas tents or are thinking of getting some, you need to know something about canvas care as well as looking after tents in general. 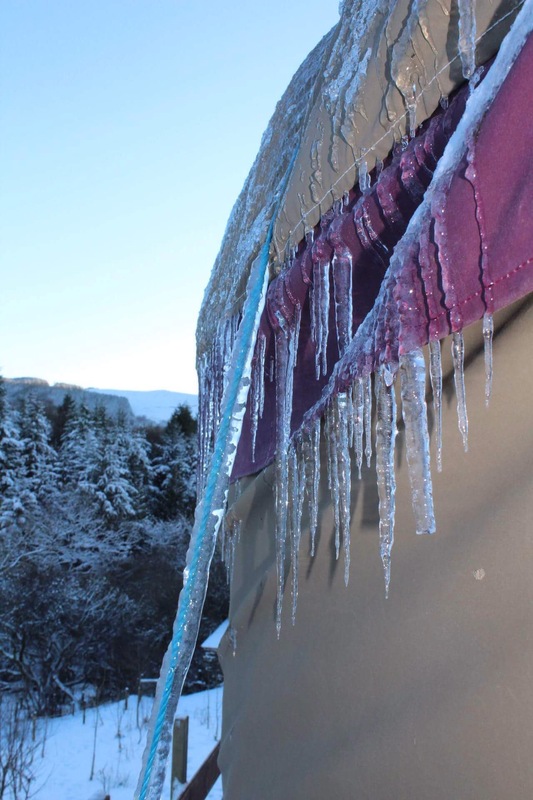 Some site owners avoid tents because of the maintenance – one should remember that they are tents after all and you can’t just put them up and not think about them when the Weather Gods are playing or let them sit unheated through the winter. 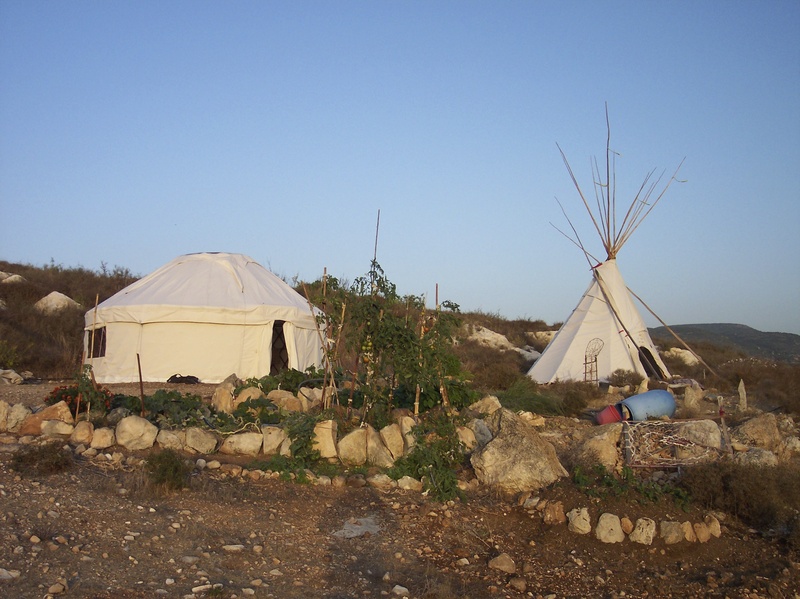 If you want something with lower maintenance, best go for something more solid like a hut but personally, I think the romance, beauty and simplicity of nomadic tents, such as tipis and yurts, is well worth the effort. So canvas…first I would advise you NOT go for cheap canvas however tempting it seems. A lot of the imported Mongolian yurts are made from a heavy canvas which is made for the dry climate of Mongolia but doesn’t adapt well to damp European climates and the canvas will quickly leak. 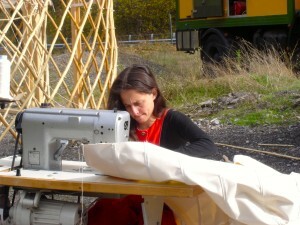 Our main work is making yurt covers, and have re-covered many a Mongolian yurt barely in its infancy. The usual canvas used in the UK is 12oz FWR (flame, water and rot-proofed) poly/cotton, Before 2007 it was cotton that was more popular, but the rot-proofing agent used in the proofing was banned, so a new one was used which was actually water-soluble! It meant that there was a batch of bad canvas around that time and we heard horror stories of canvas rotting after a year. Although a new rot-proofing agent was developed, the industry had moved into poly/cotton as it is more rot-resistant and stronger, with 50% polyester content it’s really a game changer. It’s hard to say how long canvas lasts as it depends on many factors, so we don’t offer any guarantee on its life, but if looked after, one can expect 5-7 years for a tent left up all year. One consideration in pitching your tents is the choice of location. If pitched under trees, the canvas gets dirty from falling leaves and the run-off from tree sap and this can contribute to it perishing. Trees to be extra careful of are pine and willow. Also, obviously, if pitched in the shade the canvas doesn’t dry out so quickly and generally in the UK, the damp is more damaging than UV (although this summer has challenged that trend!) In hotter climates, such as Southern Europe the UV exposure continent, damages the cotton element of the canvas so it is worth thinking about alternatives to poly/cotton (see below about acrylic canvas). Next …general maintenance… we recommend reproofing the canvas once a year which can greatly increase its longevity. Before reproofing one should clean the canvas with a soft brush and warm water, no soap, no scrubbing, no pressure washing, but as long as you reproof the canvas well it should be OK. Remember that any cleaning will remove some of the proofing. 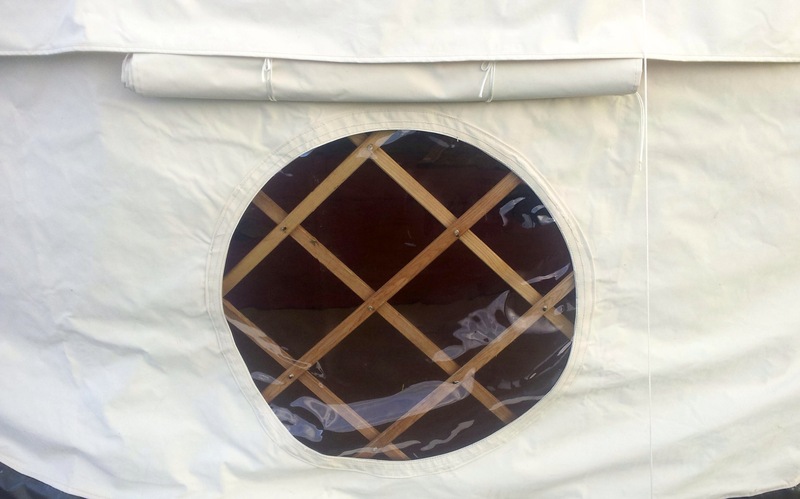 (Obviously, white canvas shows the dirt and mould more than other colours, so many of our customers, when replacing yurt covers are choosing to replace white covers with darker colours, such as sand). Reproofing is usually done with a paint-on solution when the tent goes up for the season – various products are available, but mostly only contain waterproofing and rotproofing agents. Recently the FWR proofing solution used by the manufacturers themselves has become available. (We can supply this at manufacturers cost). 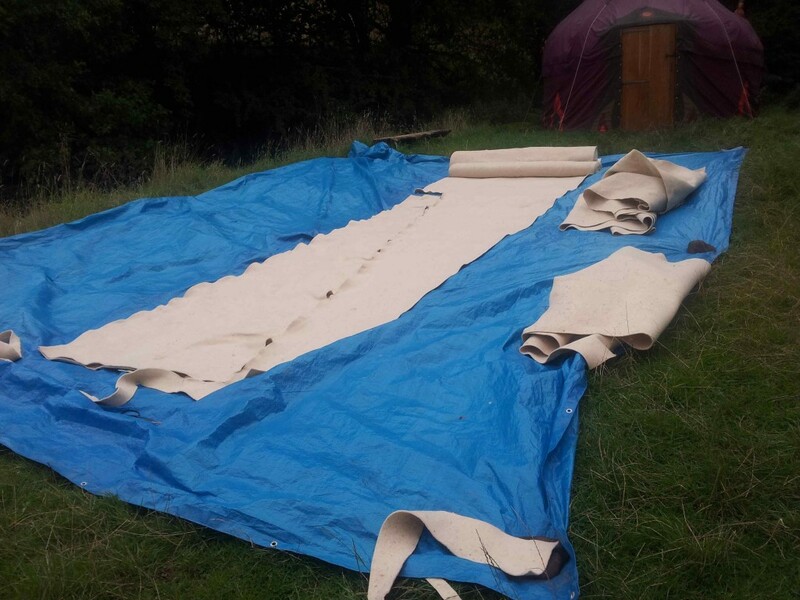 We have heard stories of tent covers being sent to professional cleaners, who have little experience of canvas and come back unproofed and sometimes perished although there are now companies who can clean and reproof for you. Another consideration in canvas care is if the tents are left standing through the winter, they should be heated at least every few days, usually with a wood-burning stove (or open fire in a tipi) and, if the tents are not being used, they should be taken down when the canvas is bone dry and packed somewhere dry and rodent free. 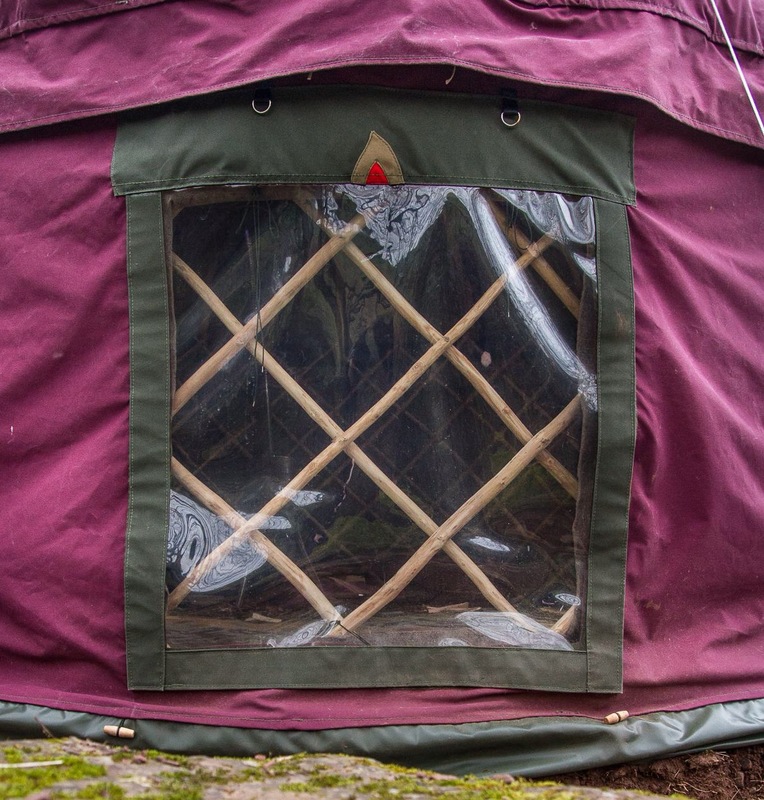 The summer before last we had a mice invasion on our site in Italy and we were surprised to discover that the mice chose to eat through the proofed canvas of the yurts rather than the wool blankets and mattresses inside. No accounting for taste. (Troubleshooting rodents and creepy-crawlies is for another chapter). There is a common perception that cottons are more ‘natural’ than synthetic fabrics, but people forget that they are proofed with chemicals. Our customers are choosing to go for acrylic fabrics as an alternative to poly/cotton as, although much more expensive, it is a better investment longterm, it greatly outlasts the poly/cotton as it doesn’t rot and it’s also stronger. The acrylic proofing isn’t in a coating but in the thread itself, thus doesn’t need reproofing the same way. It is a woven fabric so looks almost identical to the poly/cotton, yet feels nicer to touch and stays clean and new looking for much longer. 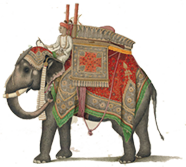 We are Spirits Intent, expert makers of nomadic tents and specialists in the canvas side of things, call on us if you need any advice on canvas or need new covers for your structures. Well, first let me introduce myself. I am a 40 year old woman who is Mum to 2 boys ages 8 and 6. My husband is called Mike. We used to live in a nice house in Bristol, UK and realised that we were missing the children’s childhoods and working too hard to pay for it all. One day, Mike suggested that we sell the house and travel round the world. I thought he was joking at first. Within a few months we sold the house, took the children out of school and set off with a one-way ticket on the trip of a lifetime. On 2 October 2015 we flew to Indonesia and made our way around South East Asia, employing a strategy called ‘World schooling’ where children lead their education, sparked by curiosity of the world around them. 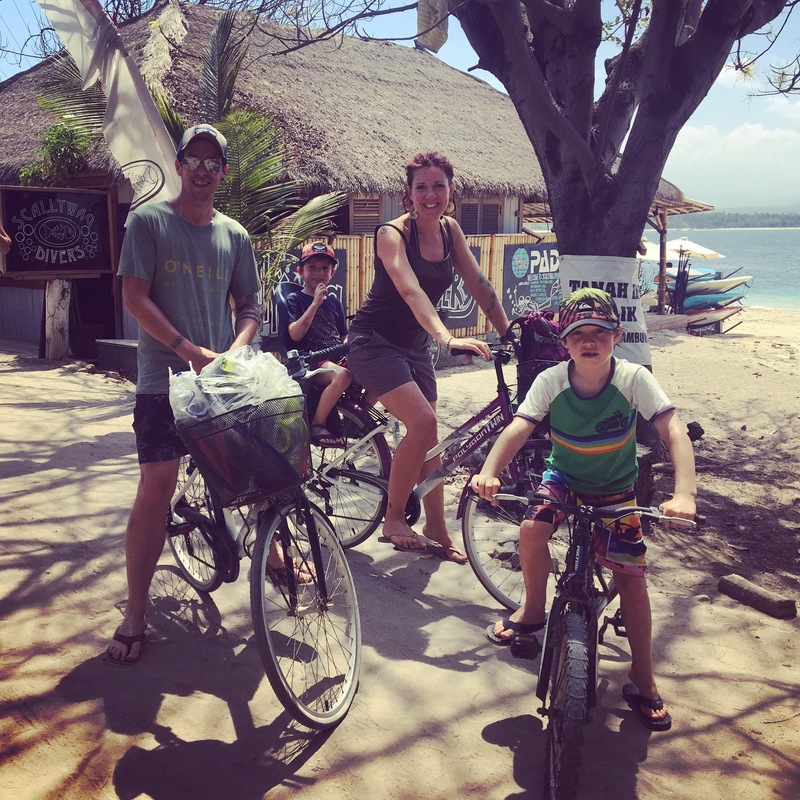 We climbed mountains in the Himalayas and snorkelled with sharks in Belize. 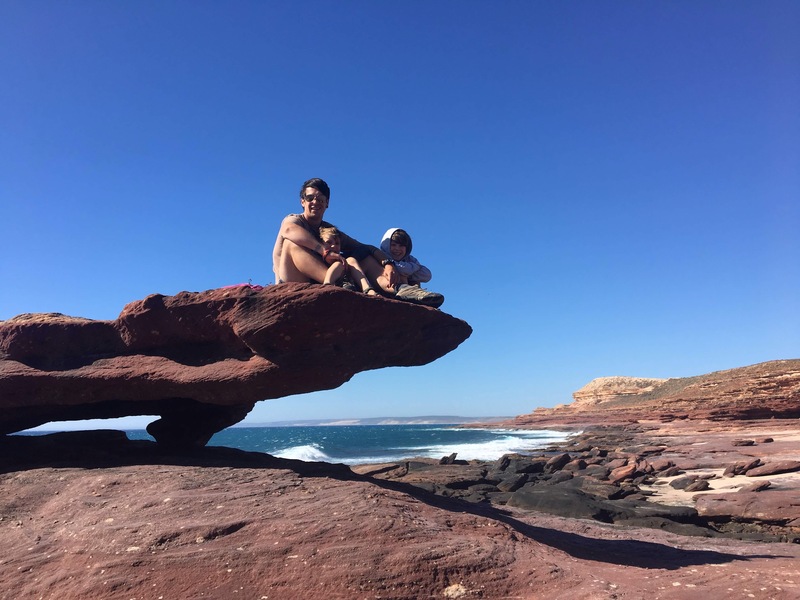 We scaled the Grand Canyon and camped on a beach amongst wild kangaroos in Australia. Our trip was immense, hard work and awesome in every sense of the word. Increasingly though, our thoughts turned to when- and if, we should return home. We missed our family and friends and being part of a community. Most of all we DIDN’T want to fall back into the trap of working to pay bills again. Old friends of ours had a smallholding in Wales with a few acres to spare. For years they had suggested we come and live on their mountain. We skyped them from our beach hut and apparently they were serious. We’d split utility bills and the field was ours, if we wanted it. 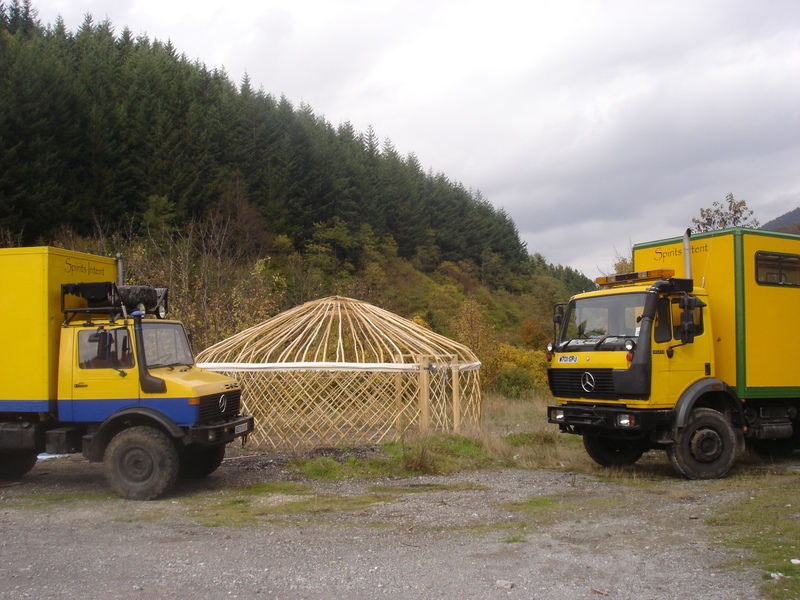 We looked at converting one of their barns, craning in a container… but we had always loved camping and yurt holidays. 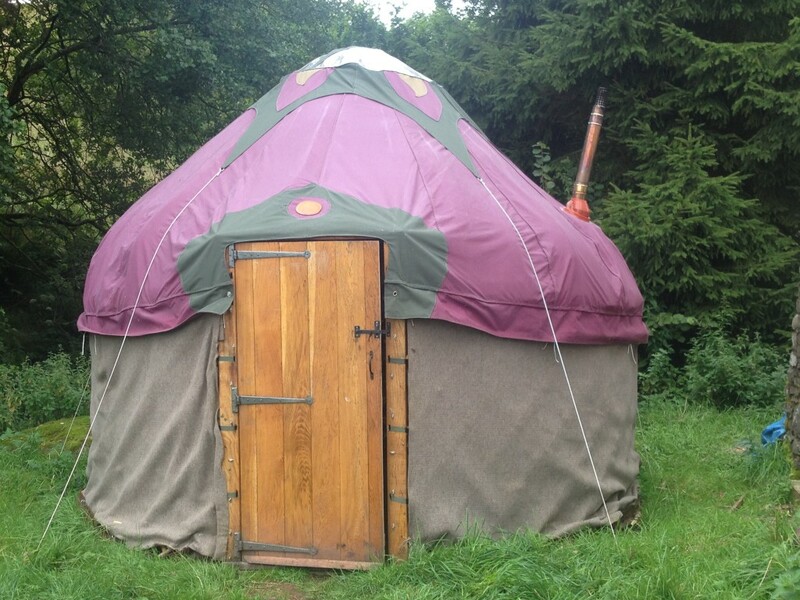 Having spent over a year living in the same room and out of 2 backpacks, a yurt would feel palatial. as big as possible to fit on the existing platform. To future proof it, we’d need to get a high wall and roof so we could install a mezzanine for the children to sleep on for a bit of privacy. Oh, and we wanted an ‘indoor’ toilet. We ordered our 22’ Turkmen Yurt from Spirits Intent and that was our decision made. Updates on their Facebook page were exciting as we could see our new home being built from the other side of the world. 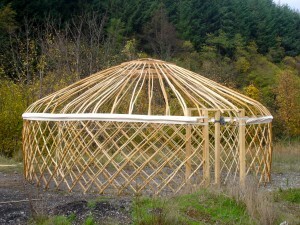 Mike was clever enough to bag himself a job when we were in Guatemala, so we had a deadline for the yurt build. We had to be moved in so he could start work on the 4 December 2017. After a whirlwind of reunions with our friends and family, we took ourselves to mid Wales on the 24 November as the weather forecast was… ok…We had been chasing the sun for 14 months and I think we had forgotten how harsh British weather could be. Anyway, this was Wales and we needed somewhere to live so we had to get on with it. Nitsan from Spirits Intent arrived at our friends’ house, hungry and serious. 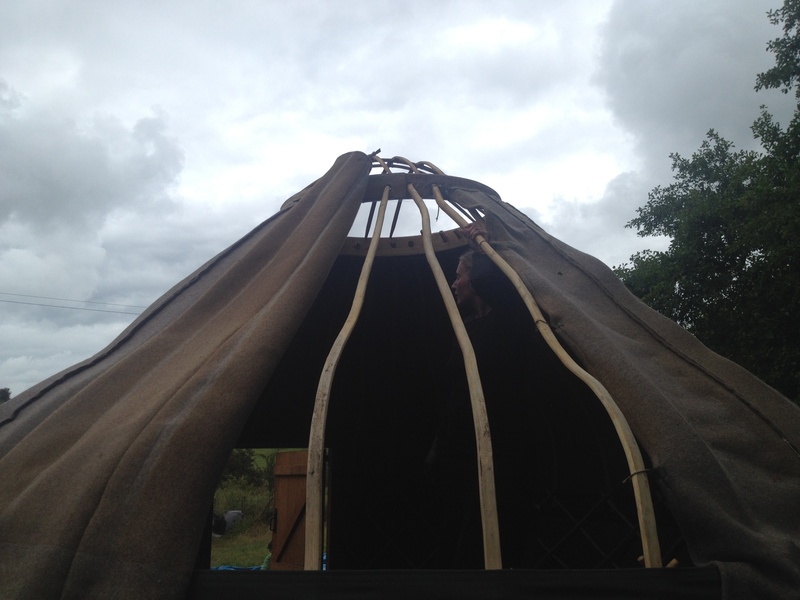 He had been building our yurt with some volunteers and had come to stay the night before- sleeping in his van, to brace us for the hard work that was to come on Build Day. I felt sick with nerves as I heard the wind and rain battering at the house windows. I think the weather forecast for an‘ok’ day might have been optimistic. The whole family pitched in. We tried to ignore the hailstorm and Nitsan showed the youngest how to do a sun dance. Oddly, it seemed to work a bit even just to lighten the mood as we got battered by chunks of ice being hurled at us from the sky. We knew we’d start to lose daylight at about 3pm. So we hurriedly put up the felt insulation and lifted the canvas on with the last ounce of strength we had in us. Tying the fabric to the lattice was painfully slow as I had to cling to the edge of raised platform whilst my hands were frozen by the cold. Nitsan’s rallies of positivity were soothing, as our energy fell to its lowest ebb. 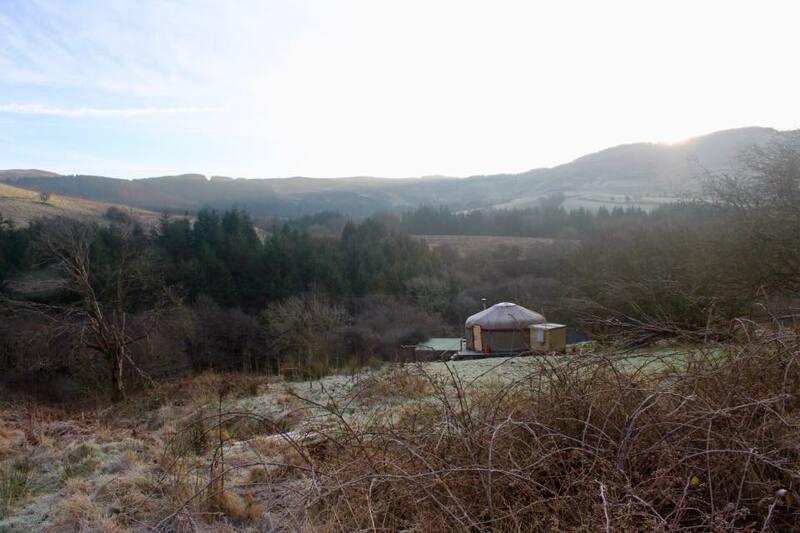 Then, all of a sudden, despite every sort of weather that the Welsh mountainside could throw at us, we had a yurt. We were soaking wet and exhausted but we had a home all of our own. We waved Nitsan an emotional goodbye, as our team disbanded- the hard work cementing a bond between us. For the next couple of weeks we worked at sanding the floors, putting in the filtered water, installing a gas boiler, hooking up electric, building a kitchen, digging drainage ditches and laying pathways… lastly we brought in our furniture. 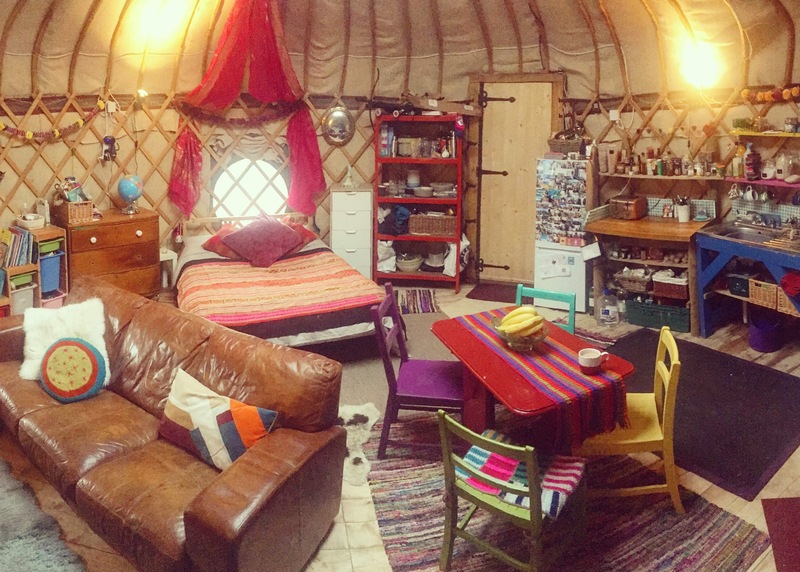 So, what’s life like in the yurt? The day we moved in our furniture a blizzard came and covered everything in 6 inches of snow. We slept and woke up to a world that was like Narnia. It looked beautiful but the reality was hard work. The first night the canvas dripped in multiple places as the seams had not had a chance to bed in…. the children were frozen from playing but it was hard to keep them dry and warm. We had no toilet, running water or drainage and icy drops of water falling on our faces when we were in bed. After the blizzard though, normal Winter feels easy! We have learnt our lessons, dried out, and are enjoying nature as we fall asleep to flicker of the fire, the sound of the river and Barn Owls calling along the valley. We have found a rhythm and have learnt that with this life, you can take nothing for granted. We wake and start the fire. 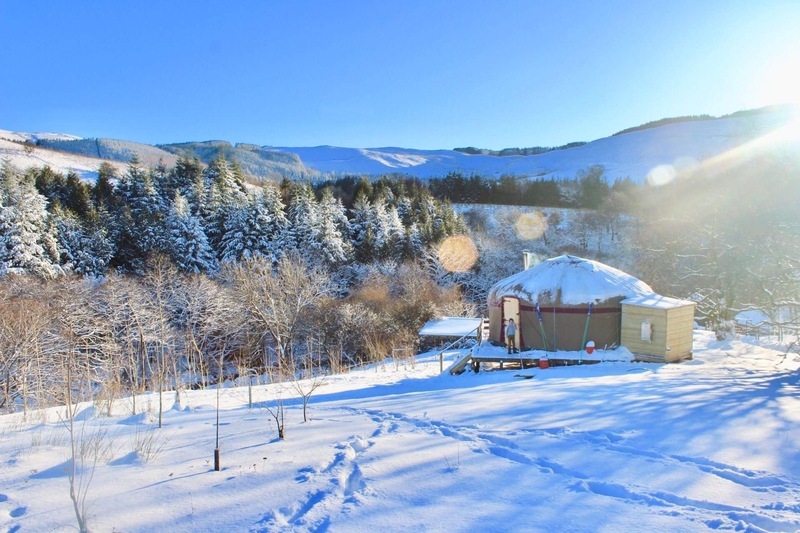 We have learnt to shower in the evenings when the yurt is warmest and appreciate that hot running water fresh from a mountain spring is a beautiful kind of sorcery. We keep the woodpile well stocked and keep muddy boots by the door. We have very warm duvets and wear lots of layers. We use ratchet straps to tie down the yurt as 80mph winds are quite common here. 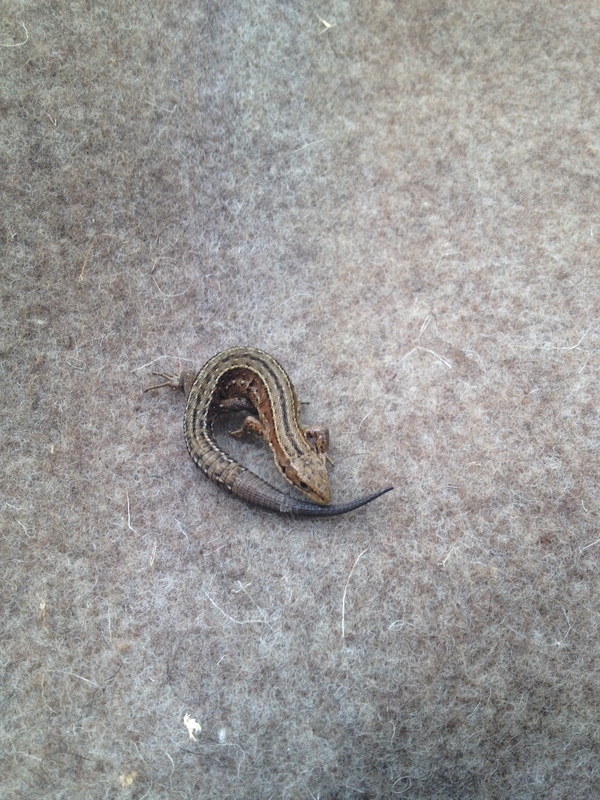 We empty the composting toilet every week and we have found that the Ultrasonic pest deterrents really work. Yes, we have found droppings amongst our dinner plates and had whole bags of clothes eaten by mice! Never again. The horses in the field next door come and bray to tell us when the weather is bad and we all enjoy being connected to our surroundings. 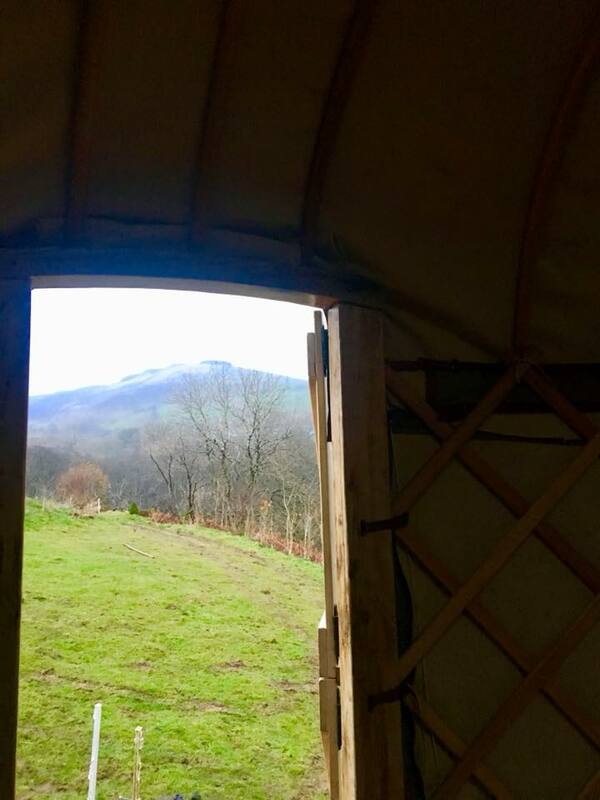 There isn’t a day that we don’t open the yurt door and have our breaths taken away at the sight of the mountains around us. Yes, it would be nice to have conveniences like ‘heating’ but the amount we’d have to sacrifice for that just isn’t a price we want to pay. Yes, to most tent people, the idea of acrylic canvas, sounds strange and unnatural, on these beautiful, traditional nomadic structures. But, the truth is, of course, that to make cotton and polycotton able to withstand the elements in a European climate, various chemical products need to be applied. Don’t worry, all have passed safety tests. 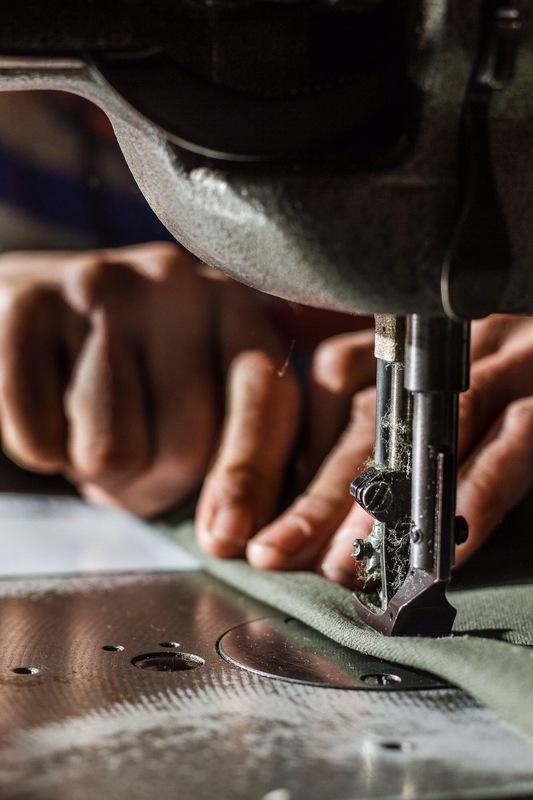 If you have lived in or worked with canvas, you are well aware of the black spot mould which appears and the inevitable deterioration of the fabric. We recommend, every year, to clean the canvas with a soft brush and mild detergent and then to reproof the canvas with a reproofing solution (we can supply a paint-on FWR (flame, water and rot-proofed) solution). Acrylic canvas, however, doesn’t rot. 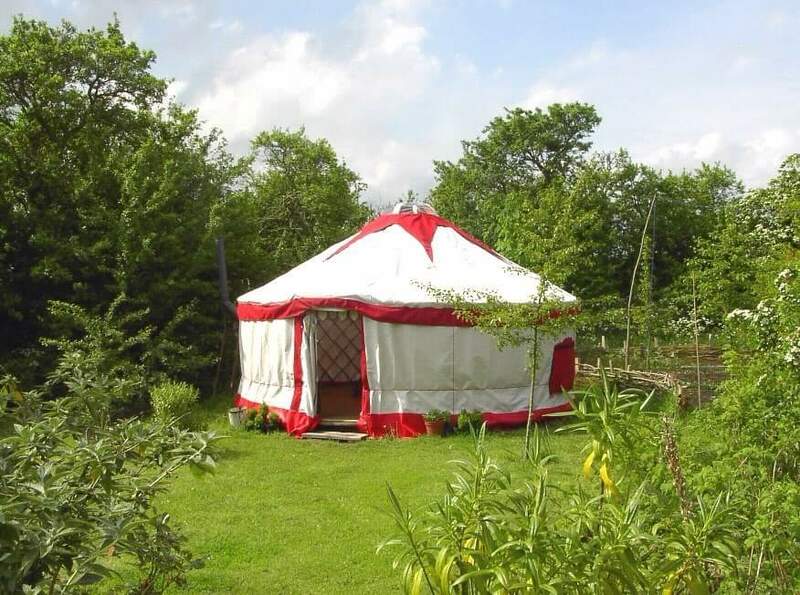 8 years ago we made this yurt cover for Tithe Farm B&B in Lincolnshire, England. They chose to have acrylic canvas, rather than the usual cotton canvas we were working with at that time, for longevity. After standing outside for 8 years in Britain (to quote Biff Vernon, the yurt owner): “The fabric is still completely waterproof. The only problem we had was that where the six ropes that hold the top star down rub on the canvas at the roof/wall angle little holes have been worn. We stuck patches on with fabric glue to reinforce these and wrapped the ropes in a fabric sleeve to reduce the pressure. That might be less of a problem with curved roof poles but ours are straight so there’s quite a sharp angle”. 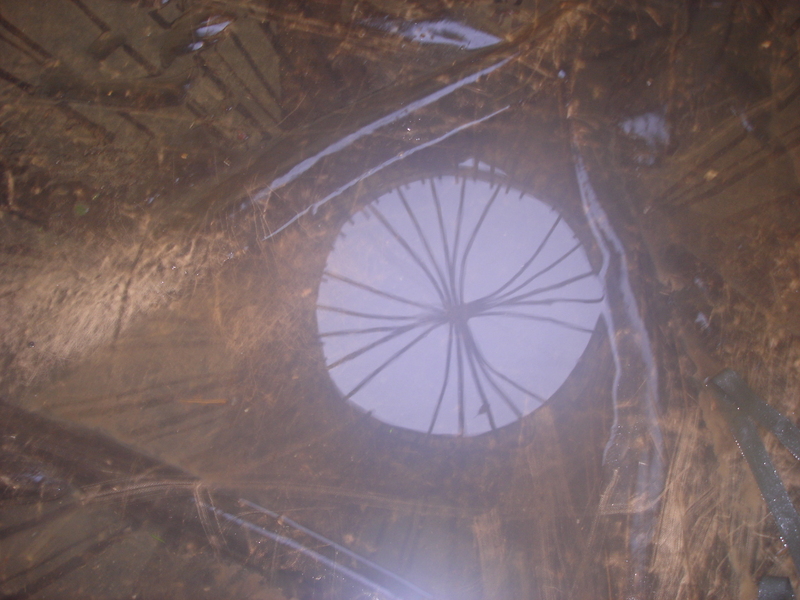 (This issue can be prevented by threading a small piece of clear plastic hosepipe onto the star ropes, to sit on this shoulder of the roof rafter). (Guess which is new and which is 8 years later). A more natural fabric like cotton or even polycotton would have well perished long ago in these conditions. The synthetic fabrics are woven and look very much the polycotton, only hang a bit more stiffly. 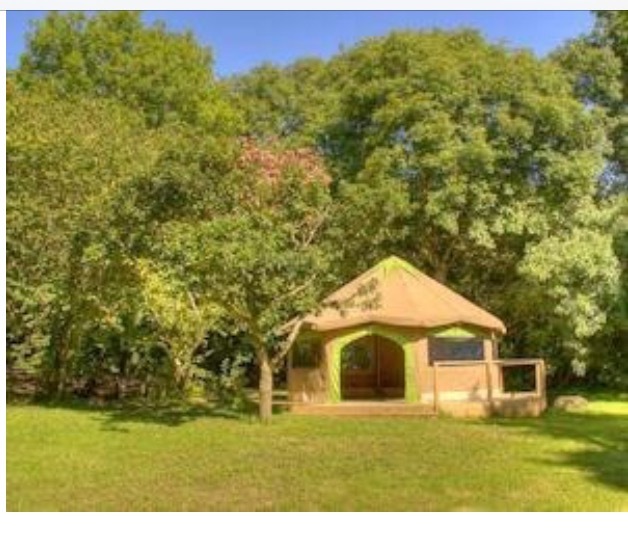 And here is the lovely little wedding pavilion at Cornish Tipi Holidays which we made 7 years ago, which we have heard, is still fine, only a bit ‘not perfect and wedding’. These fabrics were PU coated, but we are now working with a FWR (flame, water and rot-proofed), fabric in which the proofing is in the fibres themselves, so is permanent, and can’t be removed. Acrylic canvas is expensive, and not for everyone, but weighing up all the odds and external conditions, may be worth the investment, especially for a more upmarket look. The main thing that makes us different from other yurt makers is that we usually make our yurt covers without seeing the frame. “So how do we do this”?, you may ask. 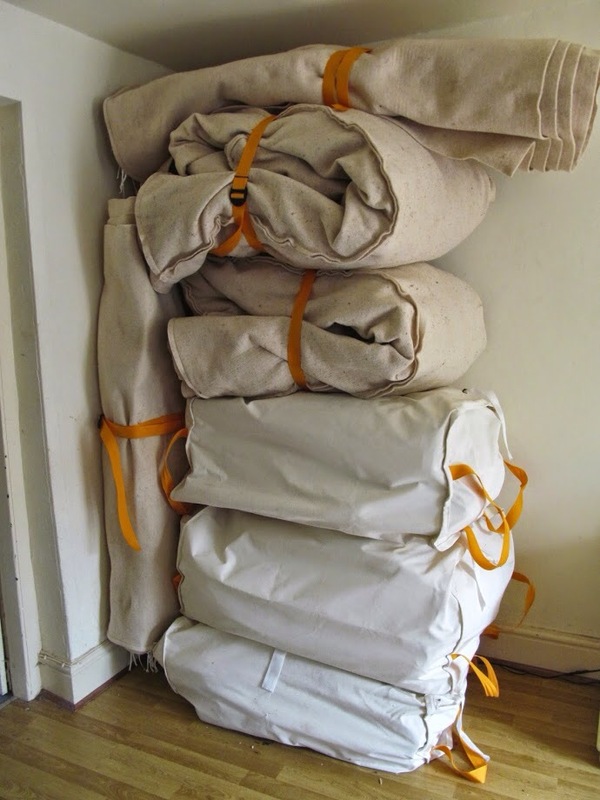 Well it is a fine art that we have refined and fine tuned over the years, and have now made (literally) hundreds of canvas and felt yurt covers in this way. 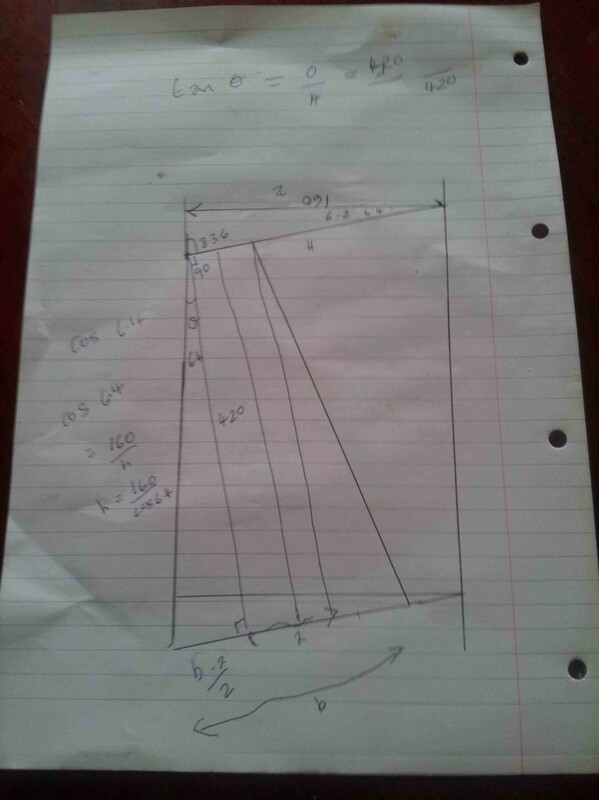 It is an ancient recipe starting with a measurement sheet which we send to be completed by the yurt owner, with lots of clear instructions to ensure the process is idiot-proof (although there have been a few cases…). 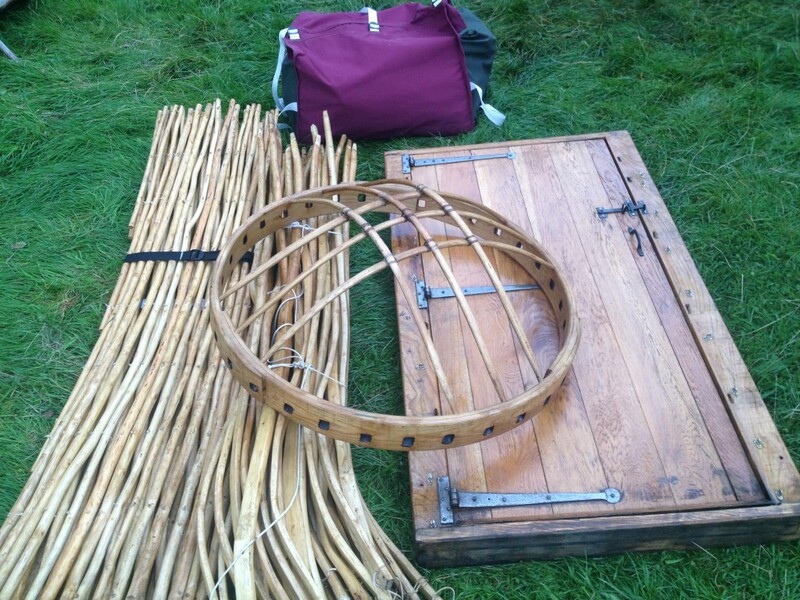 We then add lots of circle geometry, a bit of algebra, Pythagoras theorem and sometimes some trigonometry, before getting out our amazing Vietnamese scissors to start cutting the canvas, the webbing, the cord and all those little bits and pieces which make our yurt covers so delicious. Top quality canvas is an important ingredient in the pot. 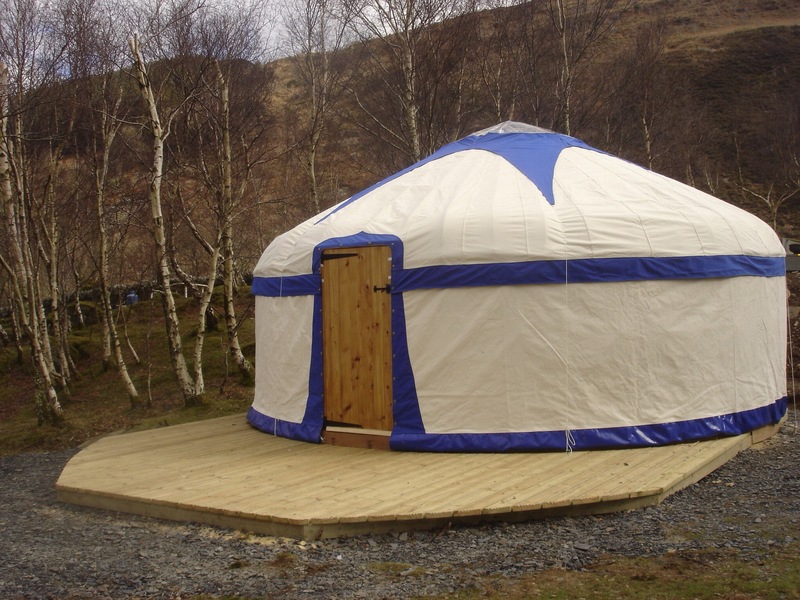 We usually make our yurt covers from 12oz polycotton canvas which is flame, water and rot-proofed, and have worked with the UK’s canvas proofers to raise the ‘water head’ (level of water proofing). 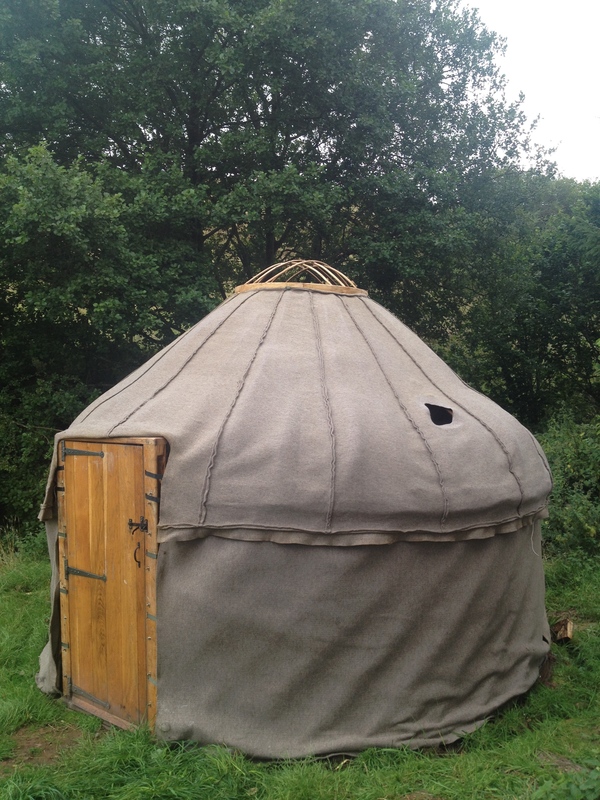 And we make our yurt linings with a really snuggly wool felt. We have two trusty sewing machines, both walking foots (feet?) which means that the heavy fabric is always held tight from slipping. One is a Durkopp-Adler, and the other a Seiko. 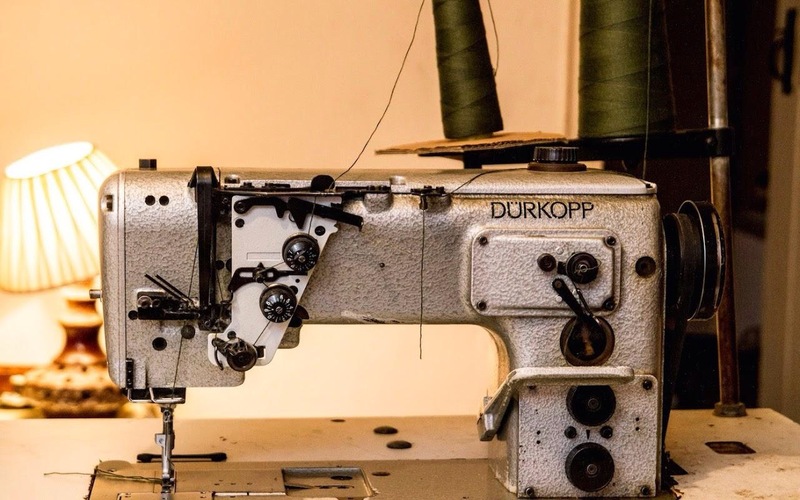 The Durkopp is the Rolls Royce of sewing machines (which means a tiny screw can cost £75), and is fast, good for the long stretches. It can also sew through a surprising number of canvas layers. The Seiko is better for detailed work like windows and it is lighter to move around so is the one that usually goes out on missions. …and we like doing decorative details..it makes life interesting. We decided a few years back that it was time to share our secrets with the world so we wrote ‘The Yurt Cover Sewing Course’ which reveals all tricks of our trade. It is always a lovely moment when the cover is all packed in the bag, and ready to be picked up by our latest friendly courier. As we make our yurt covers at a distance, we don’t usually get to see them up, so it’s good when customers send us photos and feedback. We will always hear when something is wrong, but not always when things go right. It’s often a case of needing to hold the intent until we get the thumbs up. Now, once again the wild Easter sewing rush has begun, so we have sharpened the scissors and got our thimbles out to be ready for the storm…. 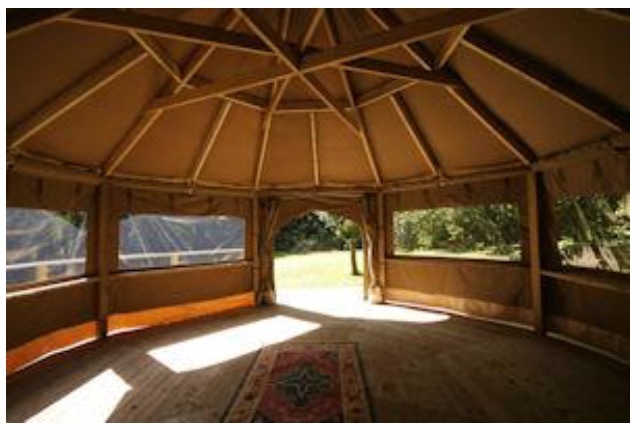 The bottom picture shows the yurt in its new home and the one above it is a true yurt. 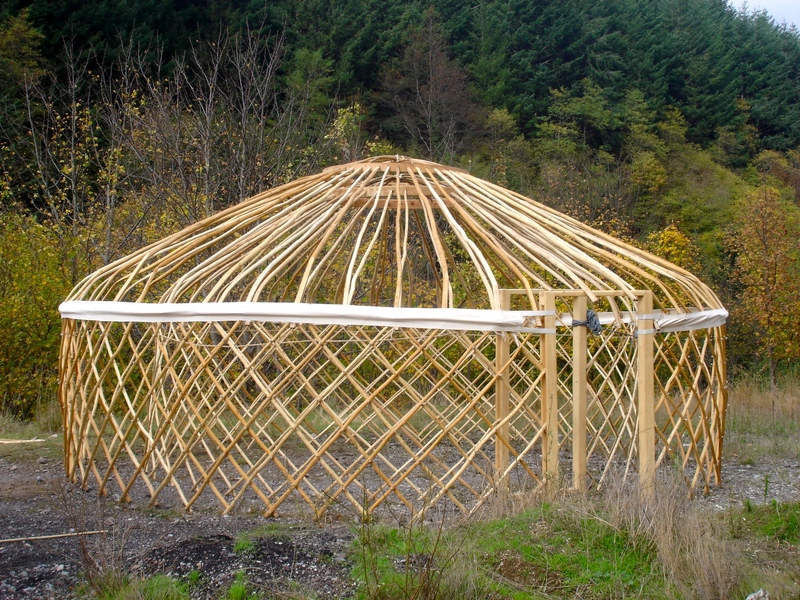 *The word ‘yurt’ comes from a Turkic word which means the imprint left on the ground by a moved ‘yurt’ (the round tent with vertical trellis walls and conical roof), and extends to meaning a person’s homeland. 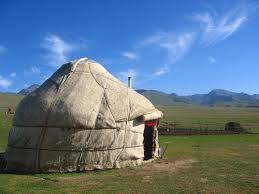 In modern Turkish the word “yurt” is used for a homeland or a dormitory. It has become used in many other languages as the tent-like dwelling which we all know and love. There is a bit of a nip in the air, the nights are drawing in and, as well as other things, we are sewing yurt felt linings: this time a big one for a 32′ yurt we made the canvas for earlier in the year. It is surprising how much difference a felt lining can make, both for coolness in the heat of summer and warmth in the freeze of winter. I only appreciated this when living in a yurt with a wool felt lining in a Hungarian winter where it got to -22 degrees C. There was still that moment of hesitancy before braving the distance between bed and stove, with the water frozen solid in the cup next to the bed. 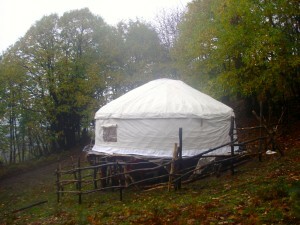 But yurts are easy to heat and once the stove was fired up, it was possible to sit naked for the morning cup of tea. It’s kind of funny that the 100% wool felt we use comes from Europe, and we are currently living in a part of Wales where there are about 48 sheep to every human. Wool wool all around. 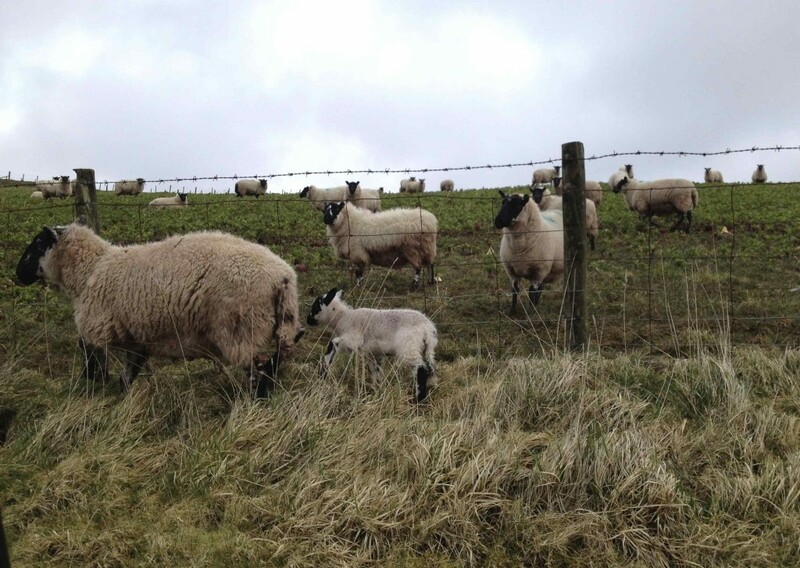 The sheep are mainly farmed for meat and wool is a by-product. Anyway, making enough felt for a yurt lining is a lot of work. Traditional yurts, of course, have thick felt outer covers as, in the Central Asian countries where the yurts are used, there are extremes of cold and hot, but not wet. 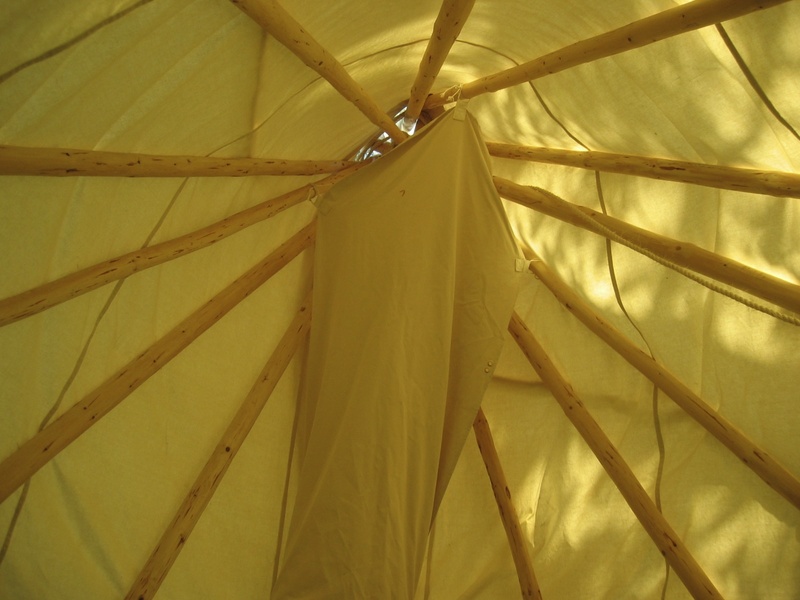 The felt’s natural oils and thickness are enough to keep the moisture out, but when the yurt came to the West, an outer waterproof layer was needed. 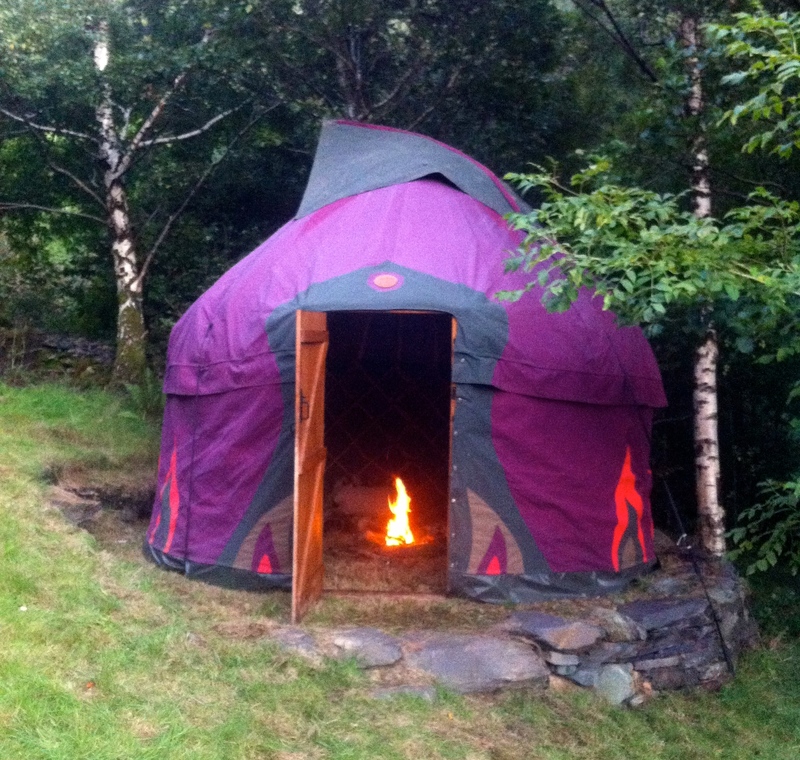 The American yurts went mainly into vinyl, the European went into cotton canvas. Felt is believed to be one of the earliest textiles and the traditional process is a huge task, usually done by the women of the group. The Mongolian method involves beating the wool first to clean it, then laying it out with the fibres parallel before rubbing water into it. It is then wrapped around a large pole and fastened securely and this pole dragged behind a horse or camel to bind the fibres together. Only then, when the felt is complete with no holes, is it cut into the shapes for the yurt cover, then sewn together by hand. So if you want a felt lining for a yurt, let us know, and we can start shearing the 100 or so sheep we will need and harnessing the camels, before threading our sewing needles. 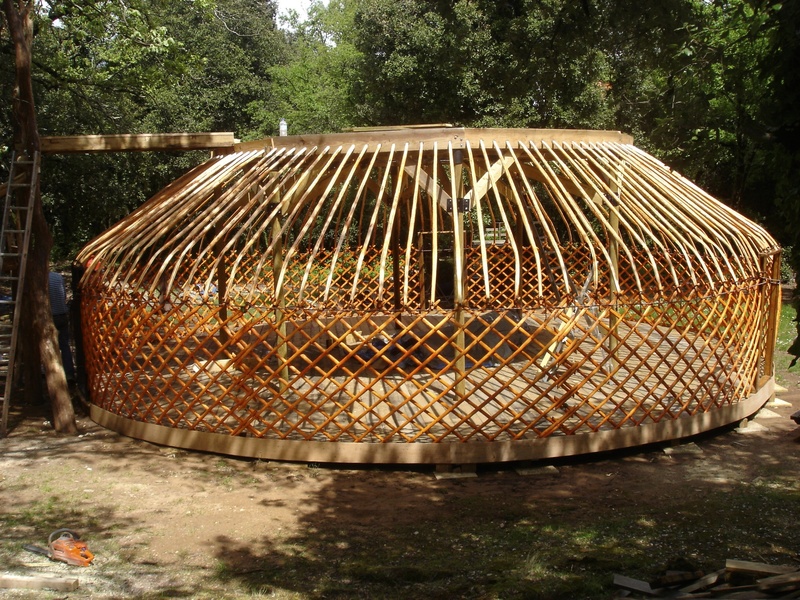 Remember the two storey yurt , and its’ frame, which was made from the Kyrgyz frames that we acquired from a French yurt maker? 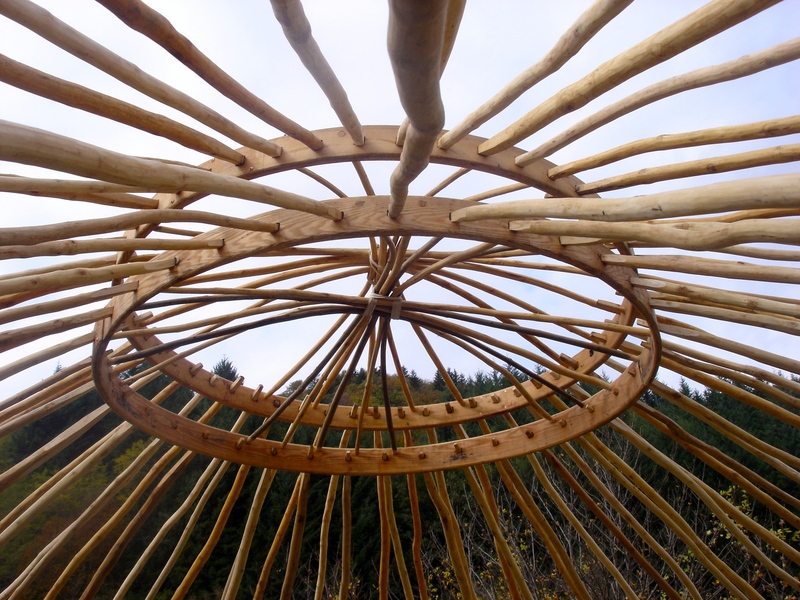 Well there was one complete yurt frame left over, which we covered for a woman who backed out in the end, but somehow it had this strange power that whenever we put it up, the Thunder and Lightning Beings came out, and a big storm was all around. 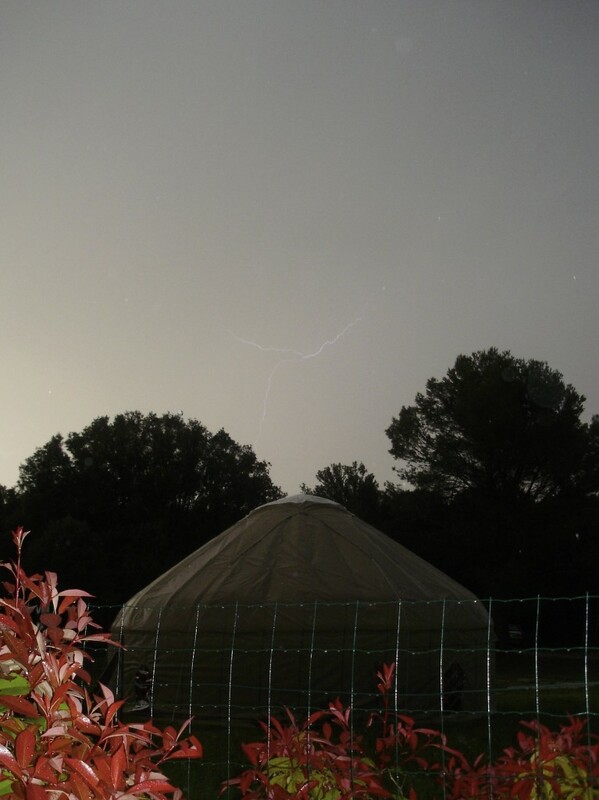 So it became ‘The Thunder Yurt’ and if you look at the picture below, you will see the lightning captured, as a big Thunder Bird. 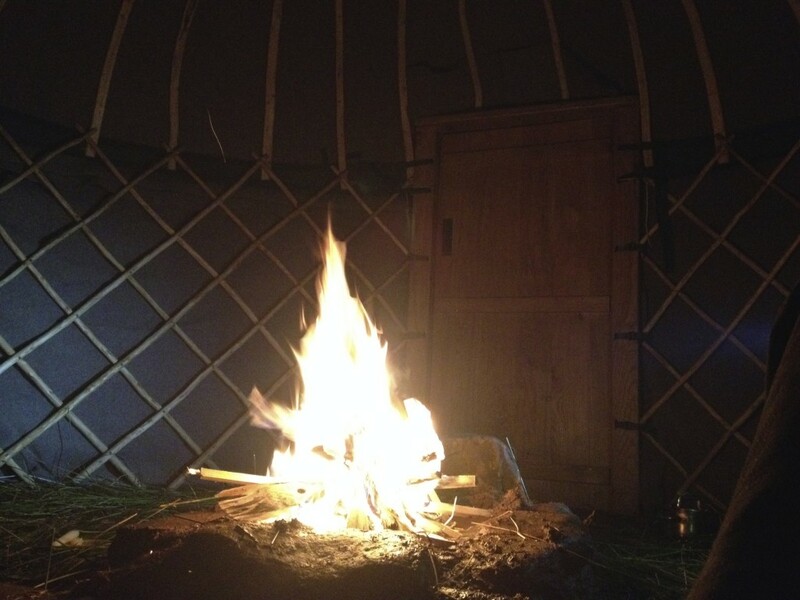 This chapter of the Tales of Yurt Power, is about the Two storey yurt which we built a few years back on the Canvas Chic campsite. 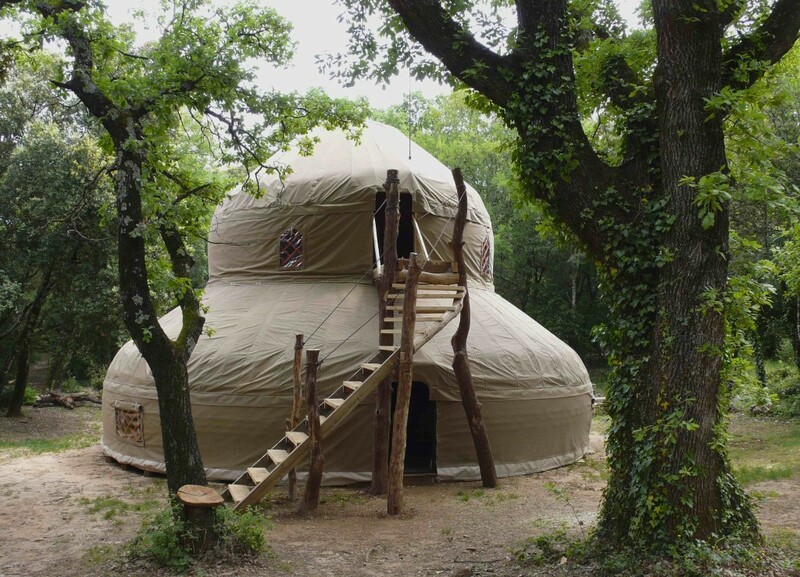 …a good place to begin this story is when I went to Canvas Chic in the Ardeche region of France to open the doors on all their yurt covers. 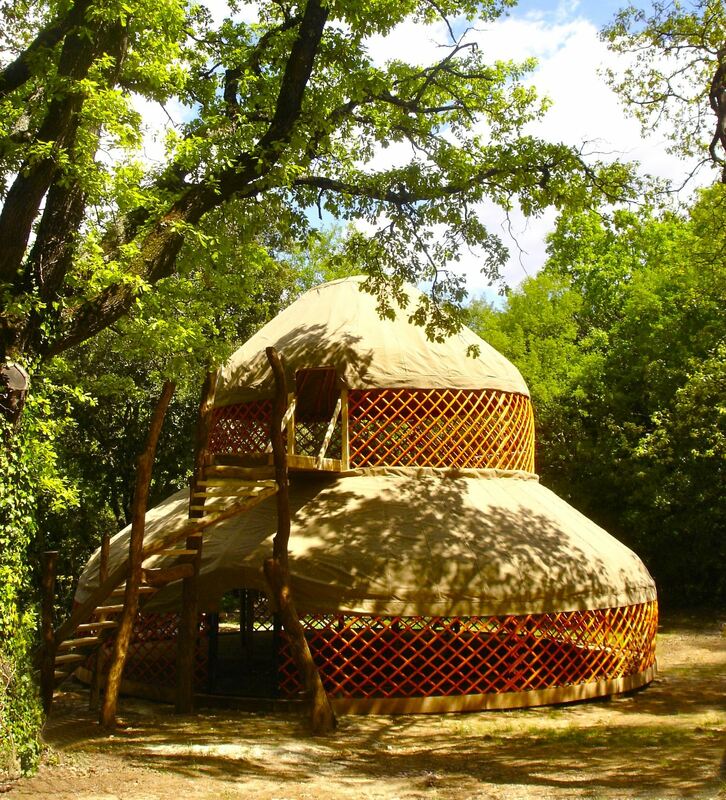 Canvas Chic was one of the original yurt campsites, in fact they probably coined the word ‘glamping’, and was situated in a beautiful green (Mediteranean) oak forest on the edge of the Ardeche gorge, with its magical prehistoric caves, rushing river and free roaming wild boar. (I say ‘was’ because not long after we were there, the owners sold the site and took the name ‘Canvas Chic’ with them, leaving their name ‘Milles Etoiles’ (a thousand stars) for the new owners). 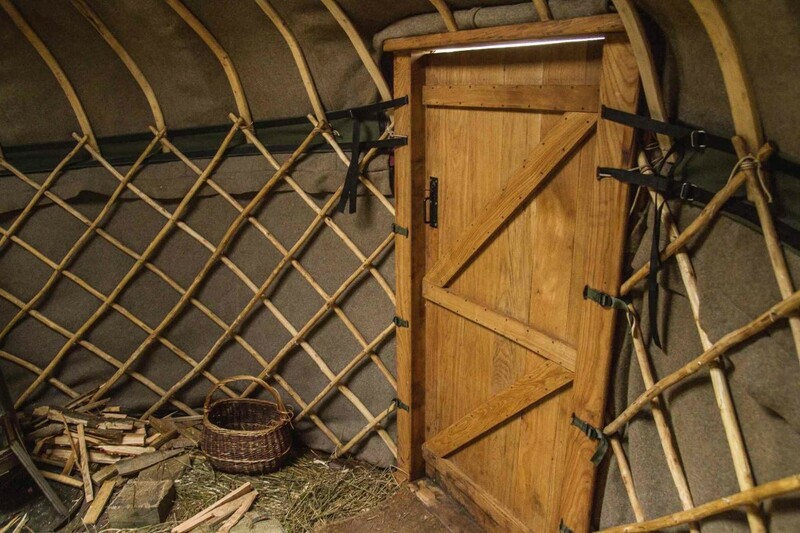 The ‘opening the doors’ task was so called because they had bought new wooden doors for all their 14 yurts, which were bigger than the old ones, so the canvas needed opening up at the doors. 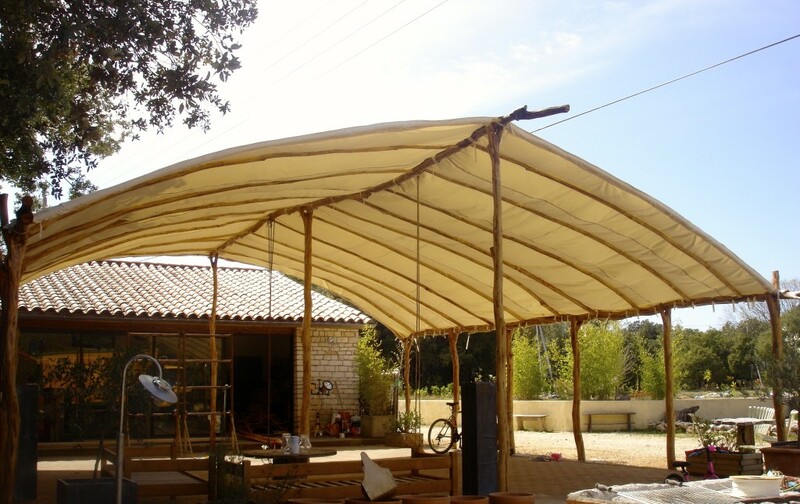 Some time later, when we were on the road in our nomadic workshop, we were called to Canvas Chic to make a cover for their terrace, which evolved into to a Turkish Pole Tunnel Tent using bent chestnut rafters, going into an oak ridge pole. But how to do it…? 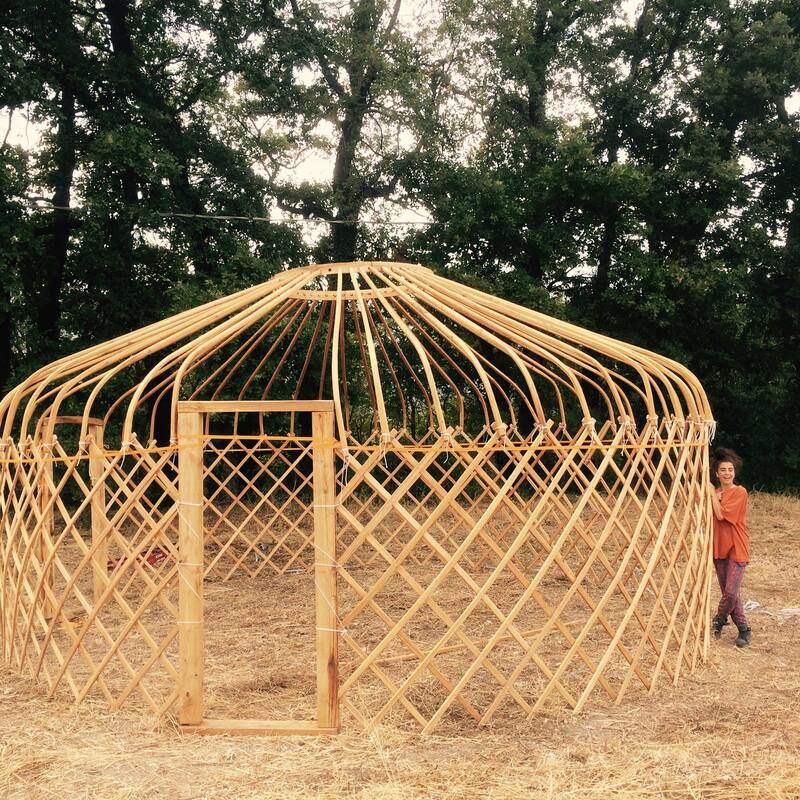 When we were wondering how to make the frame, we heard about a French yurt maker who had bought a few Kyrgyz yurt frames with the idea to make a yurt-related structure, but had decided to take his family on the road in a horse-drawn wagon, so was selling the components. 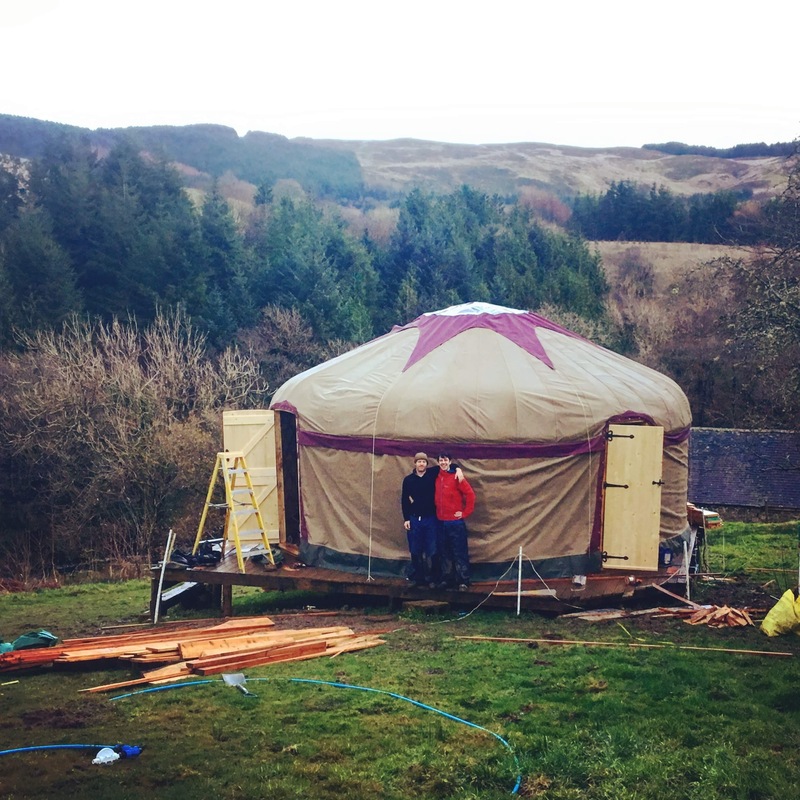 We worked out that by cutting some of the roof rafters down, magically it was exactly what we needed for the two-storey yurt frame, and one other yurt (but that’s second story). The Kyrgyz make their frames from willow by hand, shaping the components with a toothed draw knife, which are then coloured with an orange-red dye. 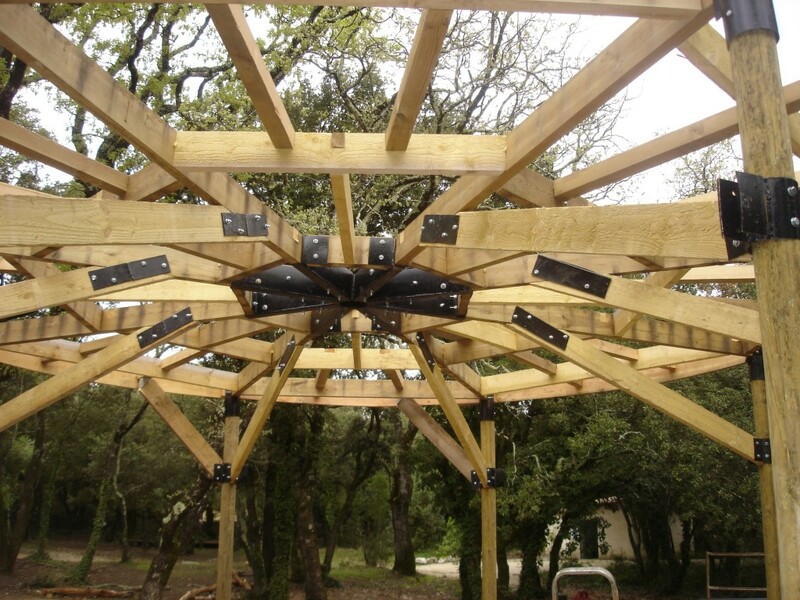 We weren’t so into a central pillar or an internal staircase as they would block the space, so the fixed deck for the top 20’ yurt sits on 8 pillars, with a side supports held by lots of metal. 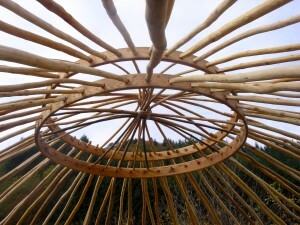 The rim of this deck then acts as a big wheel for the lower 30’ yurt. The staircase became an outside spirally one. 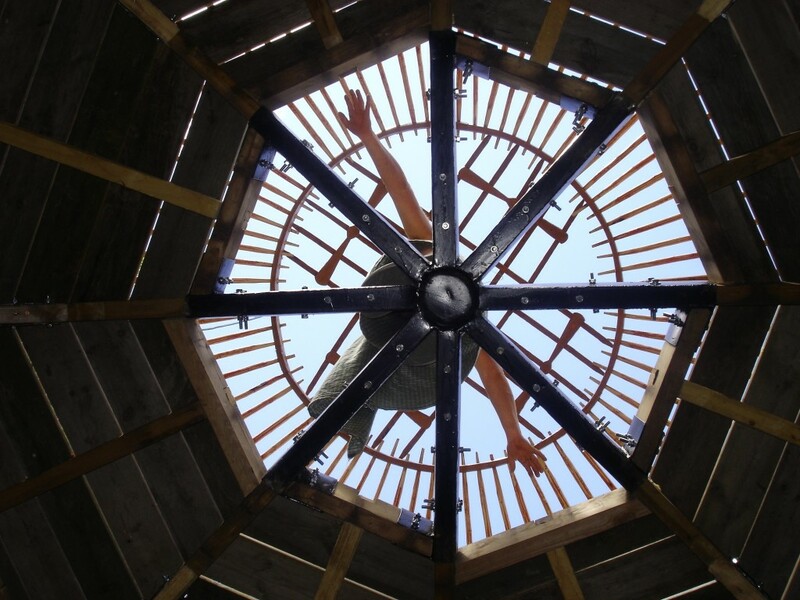 There was a willing group of volunteers who helped with the building process, which involved being transformed through the up cycling of an industrial stove for the metal of the deck (and conscious cooking). 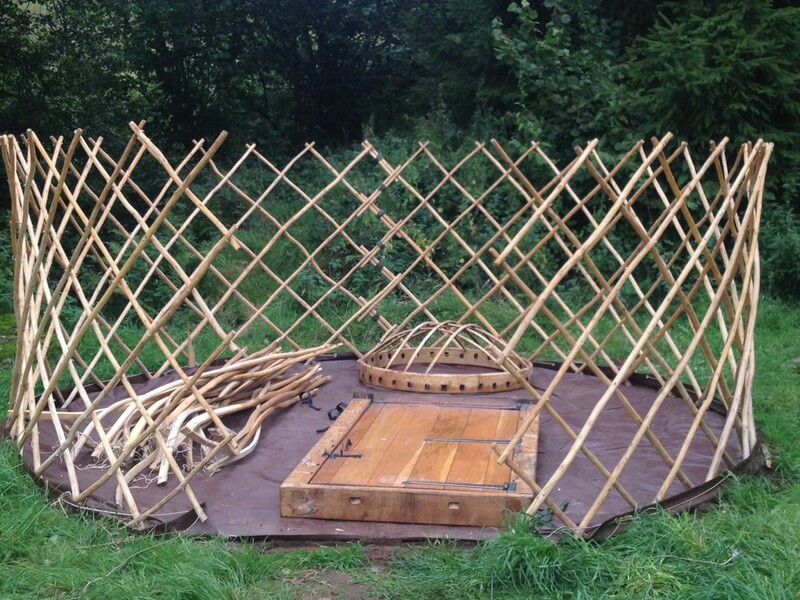 We thought it was going to be quite a job to put the top yurt cover and frame up, but it ended up being relatively simple, by doing it inside-out instead of outside-in. 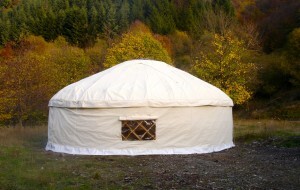 (Those who have ever erected a yurt will know what I mean). The two-storey yurt was finished in time for the first Yurt Makers Conference Gathering, where yurt makers and experts came from all over the world to play, vision and eat a lot. 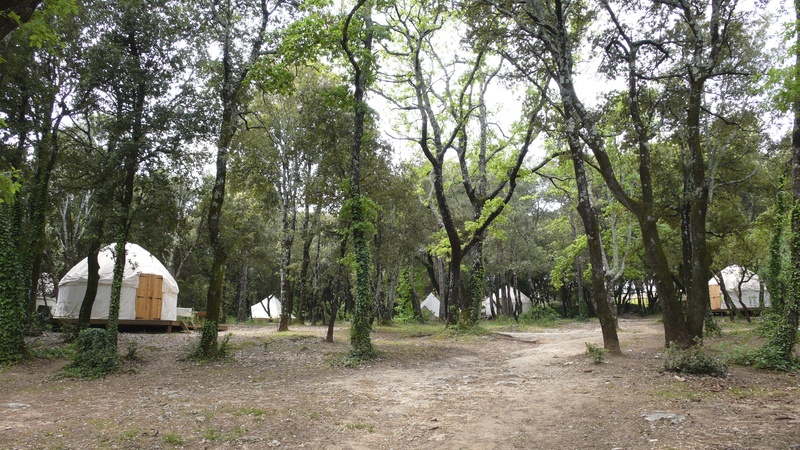 Our aim is to encourage more campsites to incorporate a tent palace at the centre to bring the people closer to a tribal feeling: the the true magic underlying the campsite experience, where a group of people come out of their separate lives, live in nomadic shelters and get a feel of the group mnd. 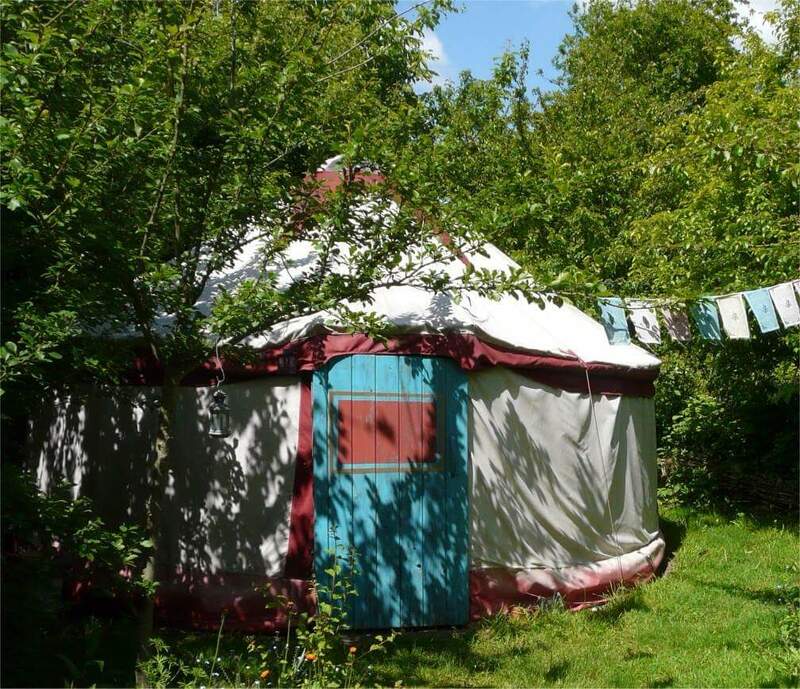 Our spring cover rush has come to a head this week, when we were called to increase the size of the yurt covers from one of the Yurtshire sites: all three yurts were to be extended from 16’6″ to 17′ diameter. 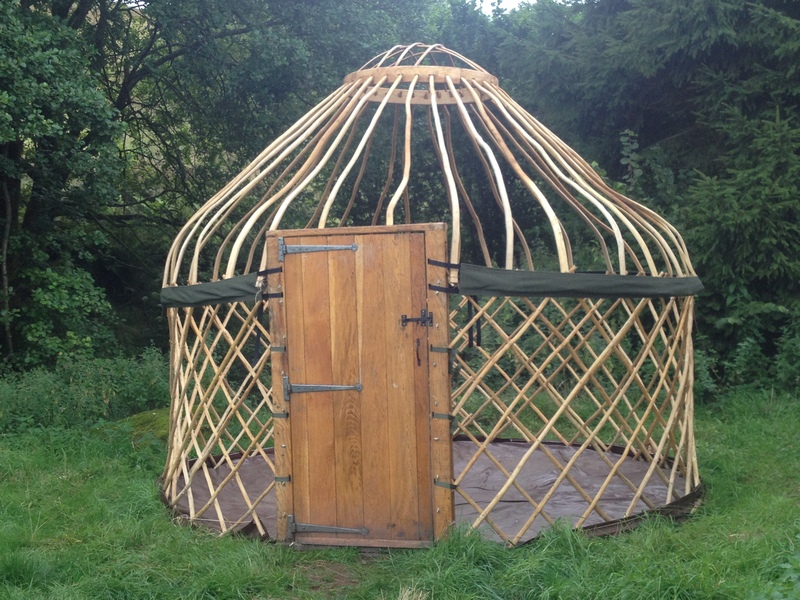 The yurt covers we made were perfect but it turned out the frames were erected too small when the measurements were taken (we make all our covers from measurements so we usually don’t see the frames), and now needed to grow some to allow for all the furniture. 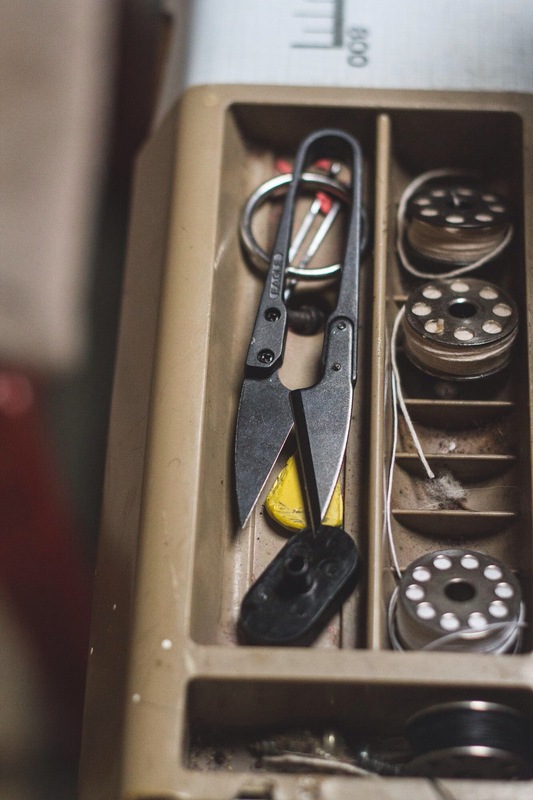 We took our Mercedes camper-Worksop truck, loaded with a sewing machine and all the equipment needed to do the job. 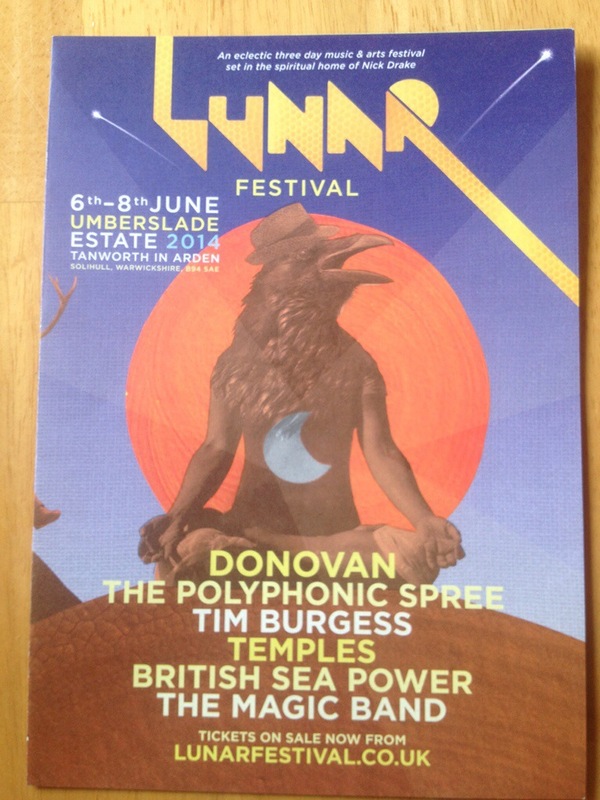 And drove through the night to Umberslade farm, home of the lunar festival. 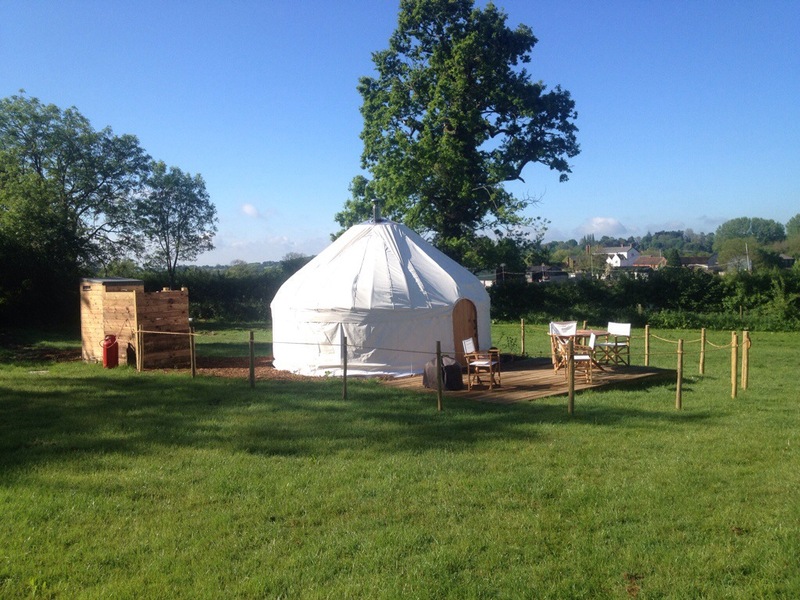 The three yurts looked so perfect on arrival. I was wondering what the owner was thinking, I thought wow what a good job we did, as he was late we thought to ourselves maybe we can just tell him we fixed it when he gets there without doing anything. But being the nice elves we decided to start stretching the yurt covers using some Spirits Intent cover wizardry. We were somewhat tired from not having slept properly, although driving through the night brought the nomads in us awake. So by the time the owner arrived with some extra covers from one of the other Yurtshire sites, it was getting very clear it is going to be a very long day. 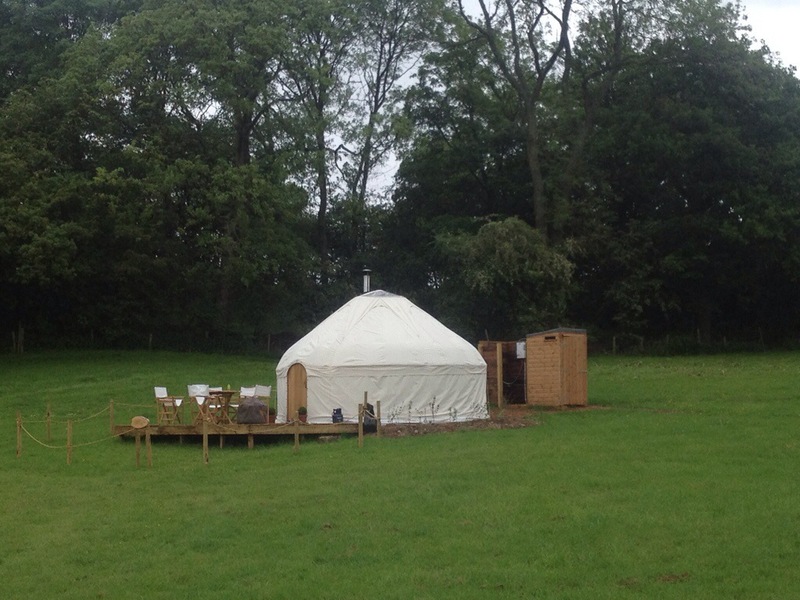 We had to get one of the yurts changed while the holiday makers were still using it. So that was the main challenge for lunchtime, they agreed to give us an hour to do so, with some extremely fast roof cover magic we got that done, and when they came back they said they did not even notice the difference (don’t know if we should see it as a compliment). 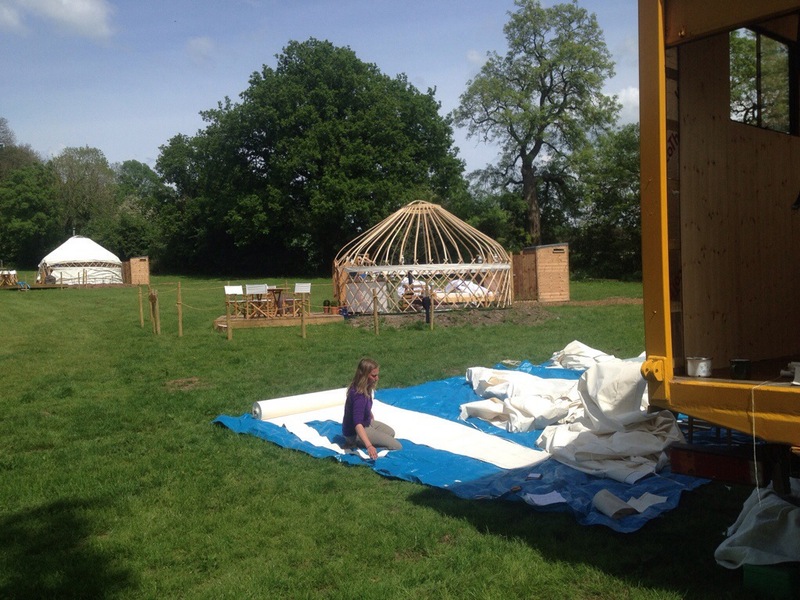 It was now mid afternoon and we still had to open two yurt roofs, and extend the walls of both, the weather forcast was for heavy rain in the night, so leaving the yurts roofless was no option. 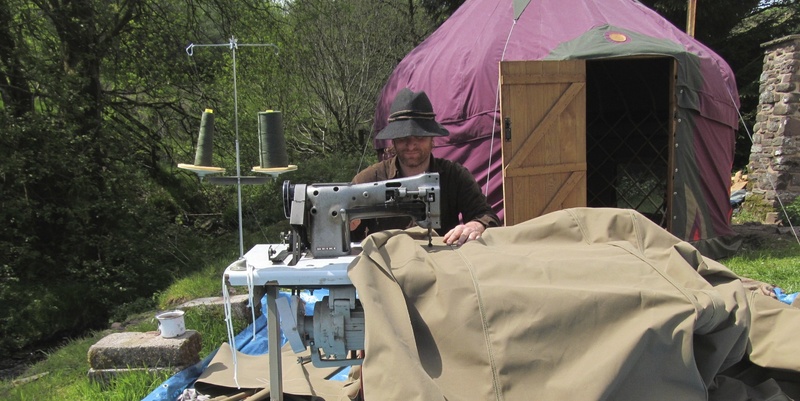 We were sewing for all we were worth, and so when our friend Henry Dowell (fellow yurt maker) came to collect his 32ft cover, we were in stitches, not sure if it’s because we were so devastatingly tired, or that the jokes were actually funny. It was 21-00 pm and we realised we just did a 5 to 9 work day. Totally exhausted we went home into the truck to sleep, the last joke for the night was “it was a really hard day’s work (understatement) just to stretch those yurt covers a few cm”. It was near death by yurt making, we thought it was funny anyhow. In the middle of the night the rain came quite hard.. …so at 4 am one of us (not saying who) went out to put the chimney through the star cap. I guess we earned our breakfast. 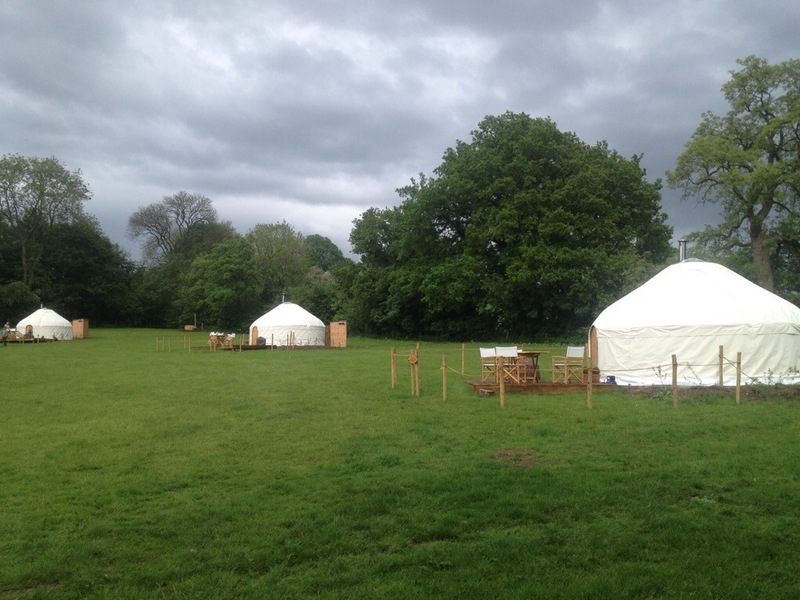 And so on departure the three yurts looked lovely (but not very much unlike when we arrived). 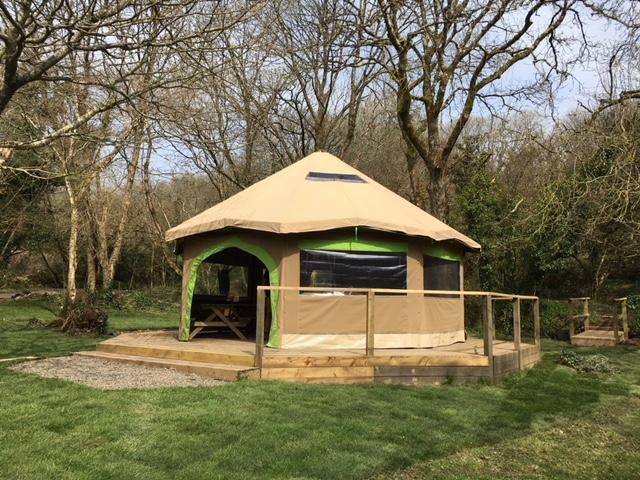 Tom Sterne (the owner) was fun to work with, and we both agreed the yurts did look better, it was amazing how much difference that extra space did. So the background of this tale is that once upon a time we were in Wales building two 4×4 trucks to go on the road: an oh-so-sweet Unimog and her big brother: a Mercedes 1820. We had done the outer structure on both: put on bodies, spray painted them (the original “yellow in the Welsh rain saga“), added ‘Spirits Intent’ stickers, put windows and doors in the boxes and, a crane at the back of the 1820 for good measure. But then the cosmic clock said its ‘time to go’, so we ended up buying a Brockhouse Army trailer for living in, which was to be towed by the Unimog, loaded up the two trucks with everything else: the materials for doing the interiors (such as insulation and piles of red oak tongue-in-groove), the combination saw machine, the sewing machine, canvas…and 2 coppiced yurt frames which were nearly finished, and tumbled onto the road. (Incidentally reversing the trailer which is a draw-bar, meaning it pivots both at the trailer and the Mog, was not impossible but almost). 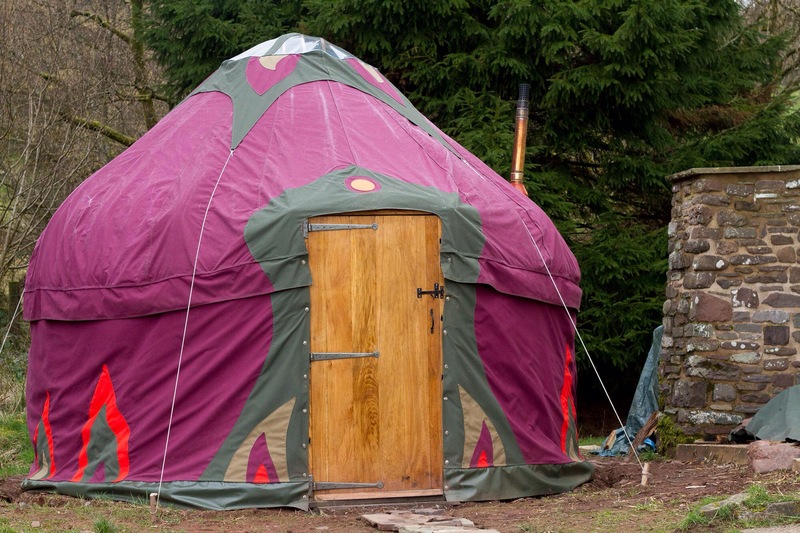 Anyway, the core of this story began when we were waiting in Italy for the go ahead on another Yurt Power Story, this one involving our Garden Fairy. It was eventually a No on that yurt, and we were (literally) about to turn for France where we had another yurt cover job when…the ‘phone rang and it was an Elfi woman wanting to know if we had any yurts. (The Elfi are a group of wild communities mainly in Tuscany, north of Pistoia, which are either on the land, or in houses they made themselves or resurrected from the old mountainside dereliction). 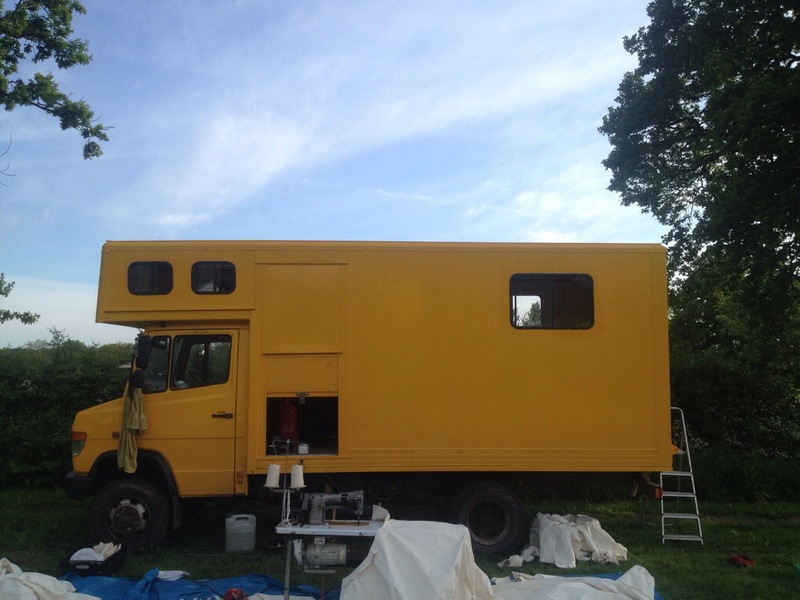 The internal builds of the trucks were coming along slowly on the road, but it would be good to have a bit have more room in them so maybe we can get to live in them, especially with winter drawing near, so we gave them a good price. We still needed to finish the frames and sew the covers. We understand that the first sequence of an event is the ‘map’, the blueprint for the whole story. This map was that when we went to meet the Elfi woman (elfess?) in a tiny hamlet, there was no room to park which, as you will see was to be played out in the body of the story. The roads up to ‘Casa Sarti’, the community who had invited us, are narrow and winding so the 1820 and the trailer would never have made it but the Unimog did! Looking for a place where we could park and work on the yurts somehow, one of the communal fields seemed the only option. That evening saw a community event in the opening of a new forno (pizza oven), and we met all the players. 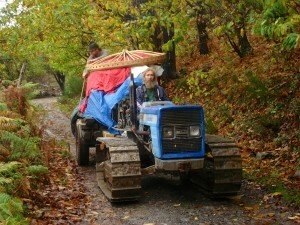 When we asked them what they needed they all said, RAIN, as it had been dry for a few months. 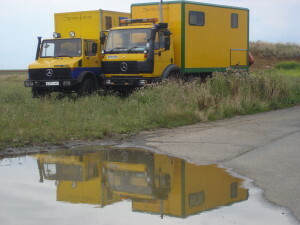 I told them we could do rain, then we had all the dramas of the community run about us using that field. There were all the objections: the cows, the road, the noise, the wells, the lack of water….so we would be going straight into the heart of the inner conflict of alternative communities. We realised we would have to find some other way to do it, maybe on the road somewhere. 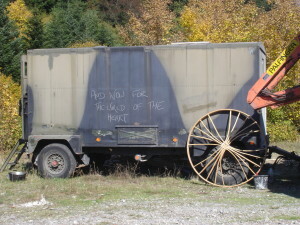 That somewhere came when we returned to the petrol station where we had left the 1820 and trailer and the boss said we could stay there. So life at the Tamoil gas station started, with a laid back boss who had a strong liking to wine lunch breaks and playing the clarinet. 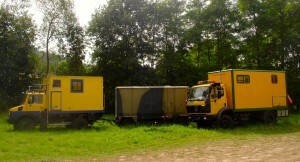 There was not much room so we had to pitch the 22′ and the 16′ yurts concentrically and sew outside next to the trucks. We were finally doing it on the road. I think the gas station must have had 50% more clients just so they could ask what was going on. It was somewhat hard to hold such a space, but it seemed that in comparison with the elfi politics it was easy. 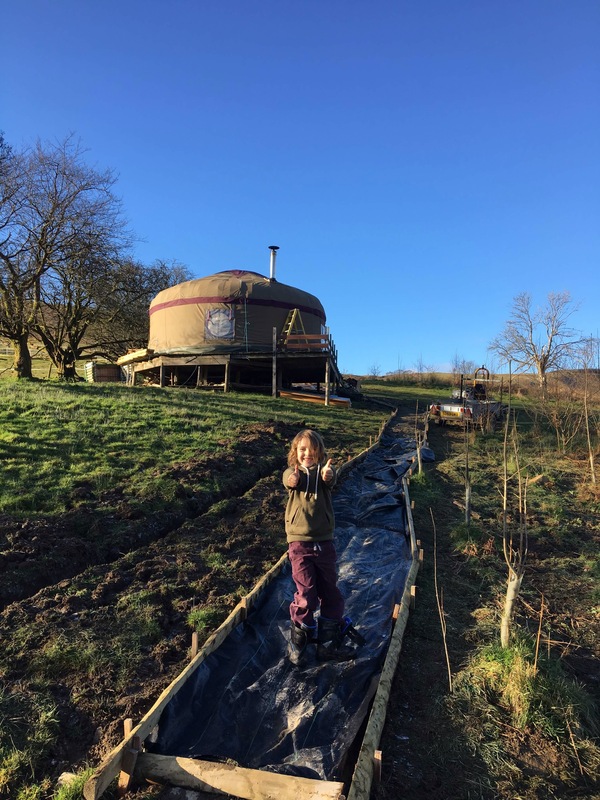 The main issue seemed to be the weather, as maybe that long awaited for rain was on the way…so we did a little marathon to finish the yurts, and, as we finished the second yurt cover, the rain started. 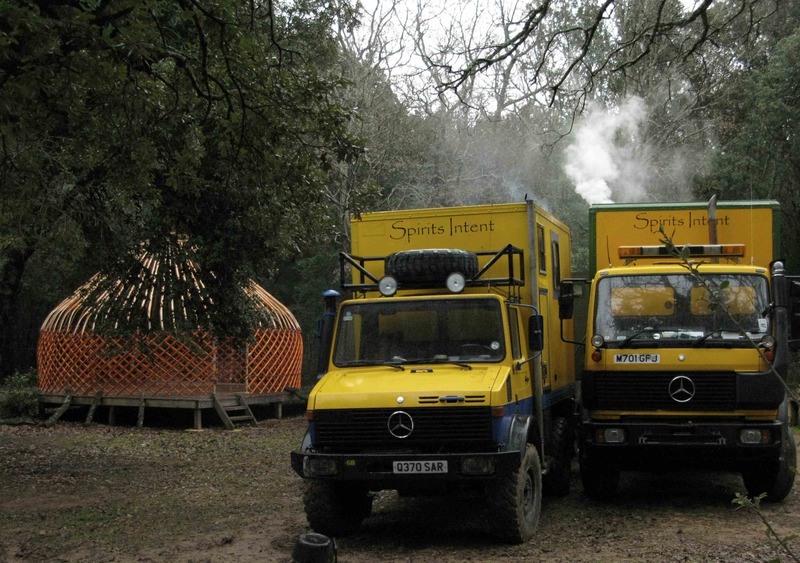 We got the boys to help and we drove the bigger yurt to the platform it was going to go on…. …and then all hell broke loose on our heads. We decided to stick it out, so we put that yurt in the strongest rain ever getting completely soaked, and even heaving to paddle ankle deep on the PVC groundsheet. 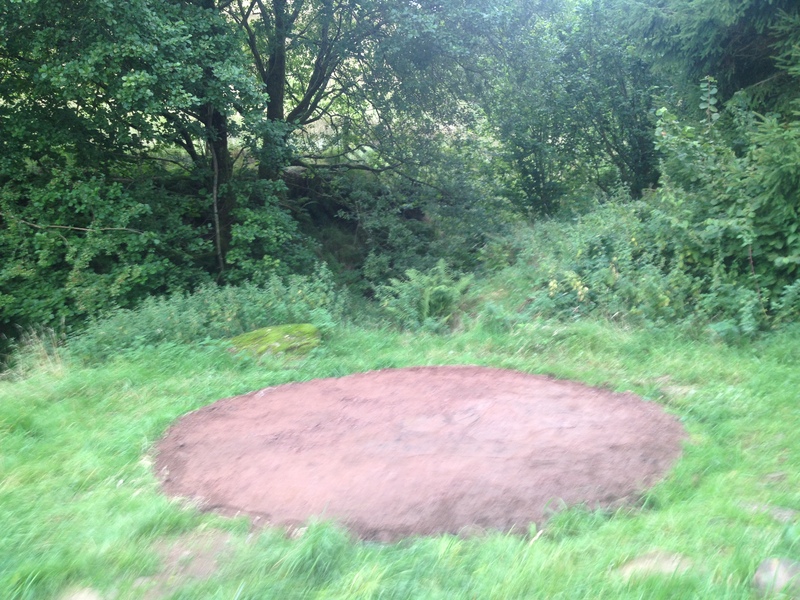 We later heard that that yurt had blown down in a storm. La Dolce Vita.